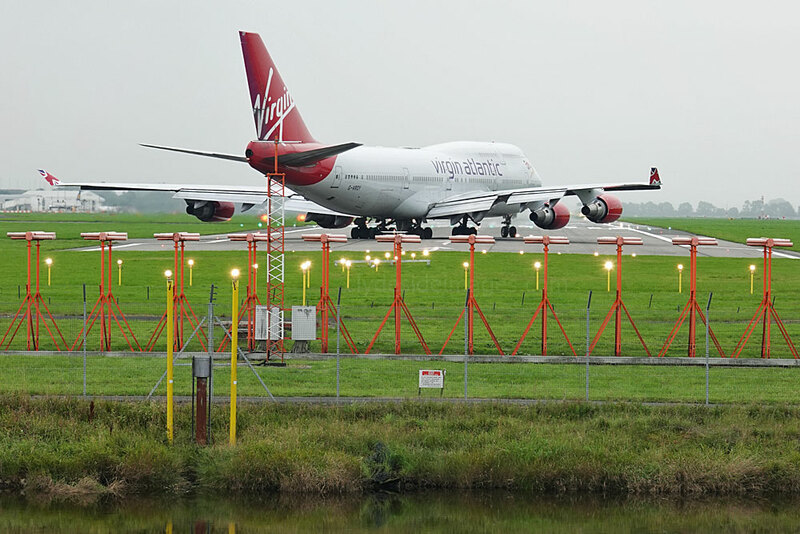 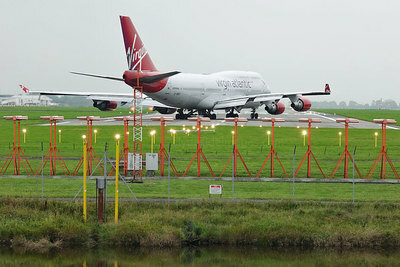 Virgin 747 G-VBIG lifts-off on the morning of Sunday 2.9.18. 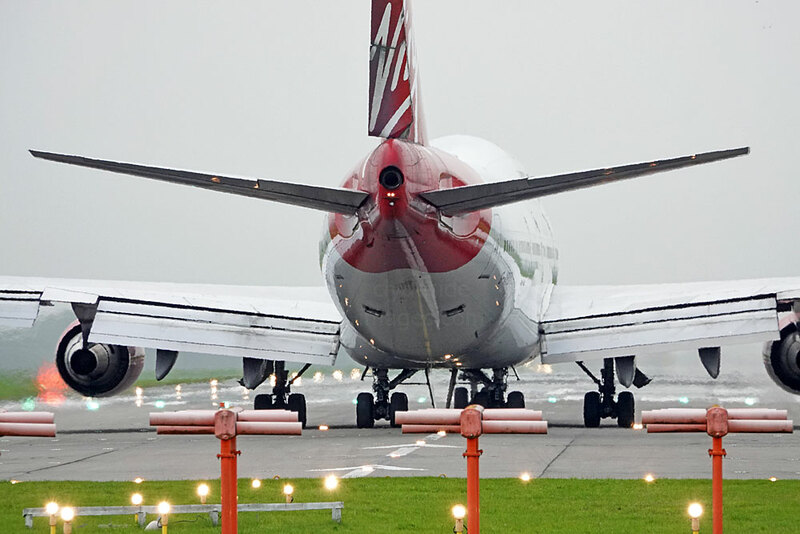 Air Canada Rouge Boeing 767-333(ER)(WL) C-FMWQ is heading for Alpha One. 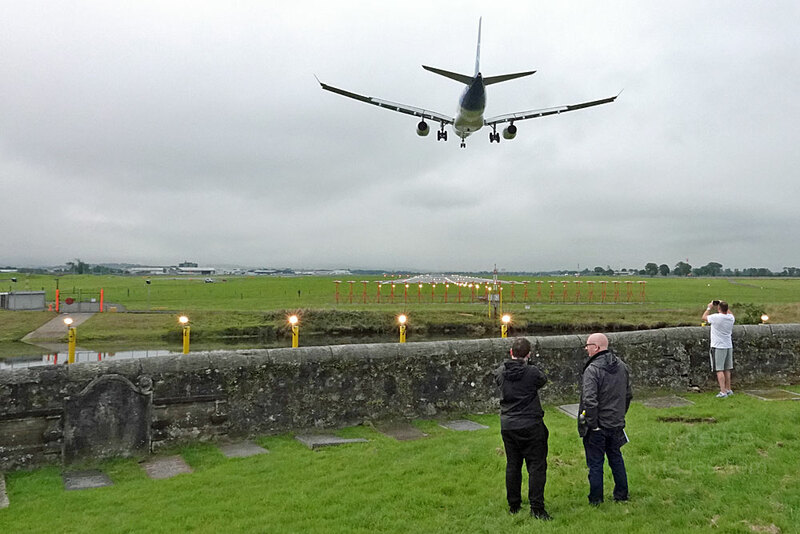 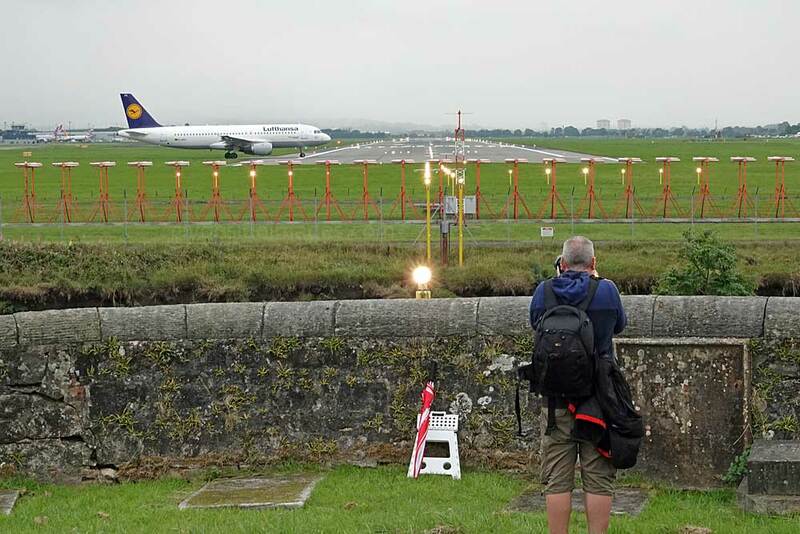 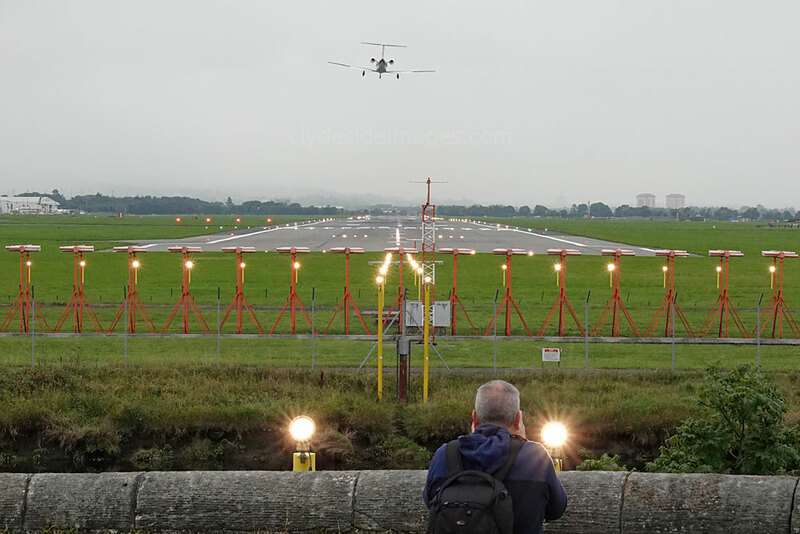 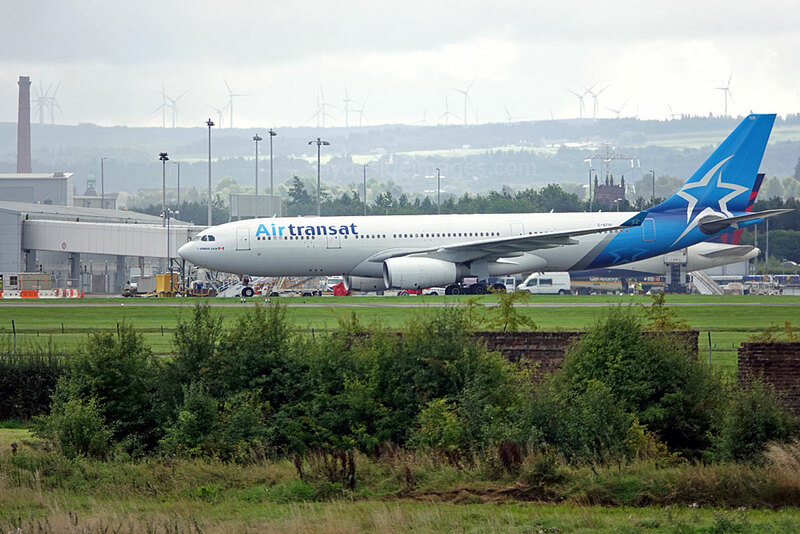 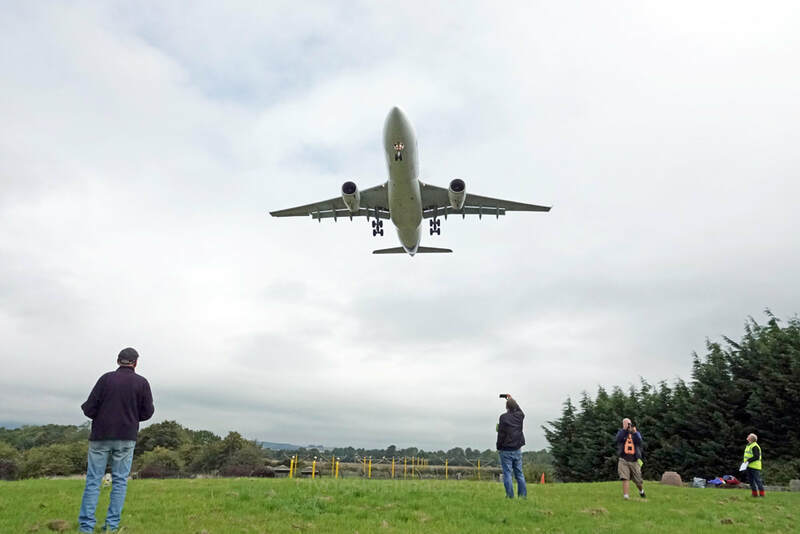 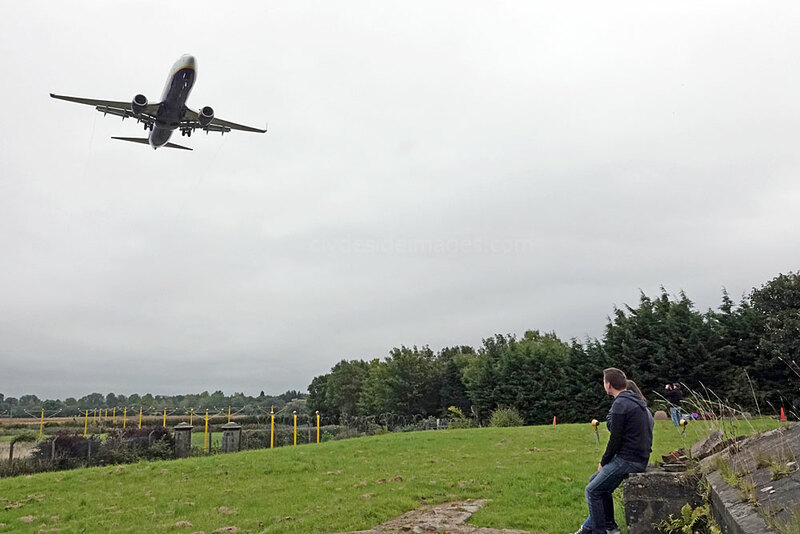 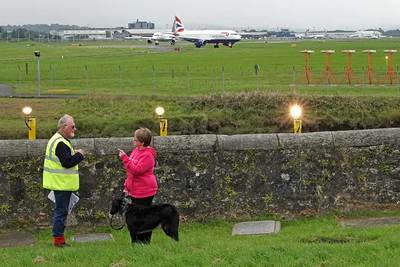 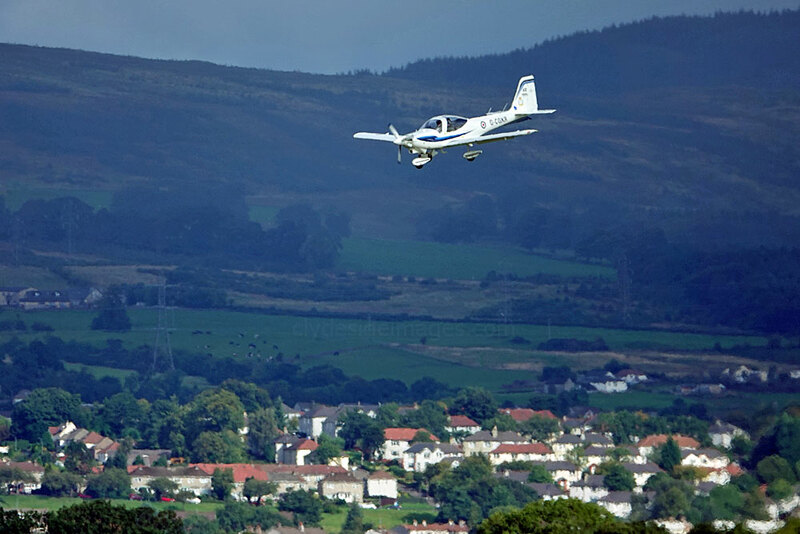 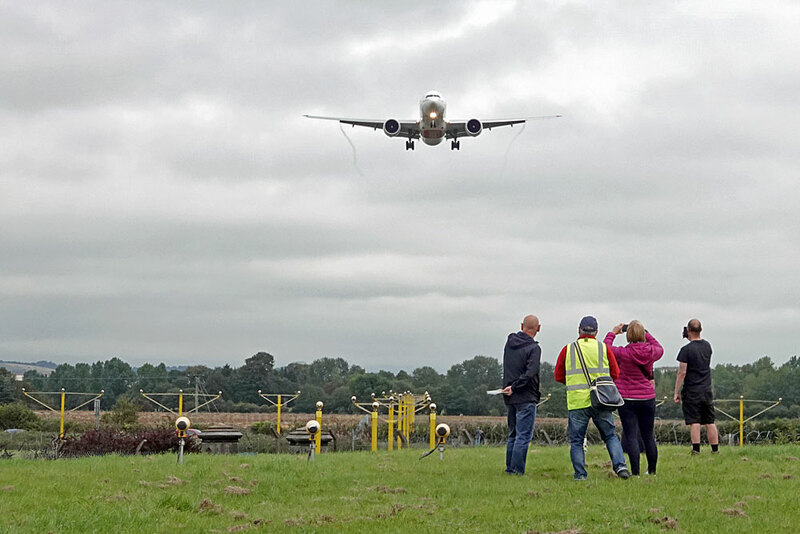 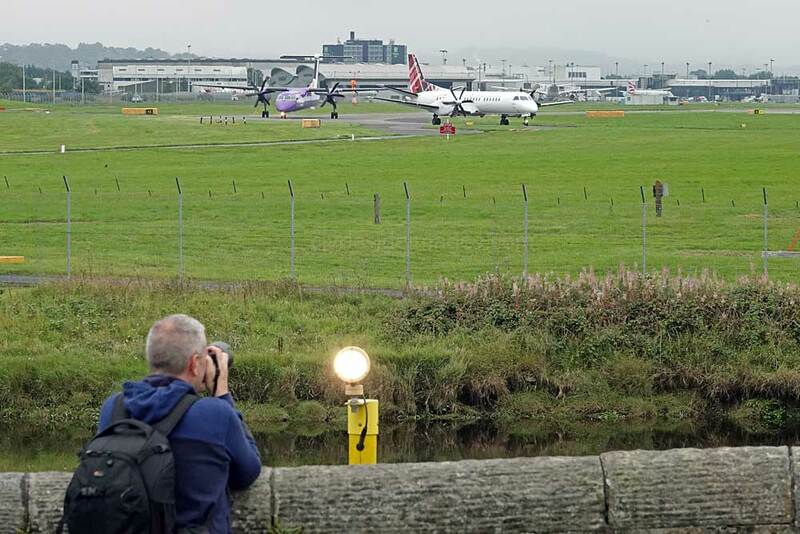 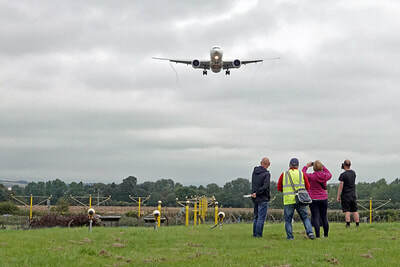 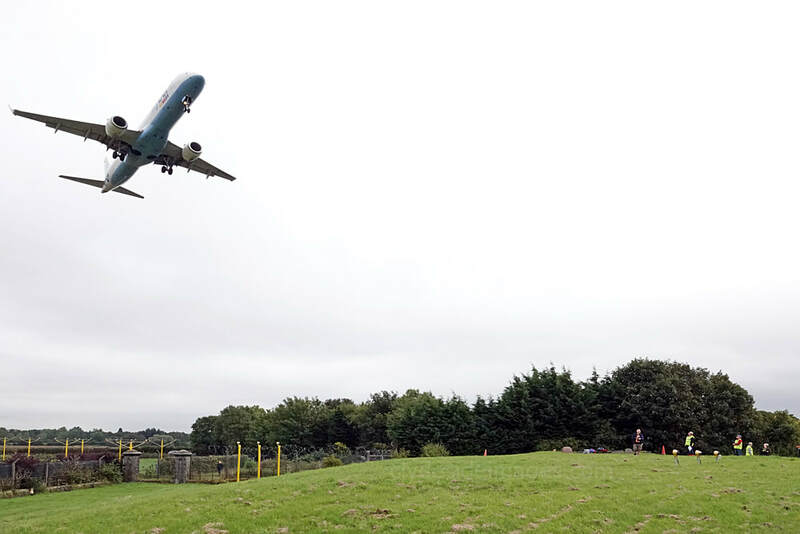 Not a great deal of outstanding aircraft visiting this month with the highlight for many local enthusiasts being the chance to take close-up shots of the action from the All Hallows graveyard under the `23` approach, thanks to Renfrewshire`s annual `Doors Open Day`. 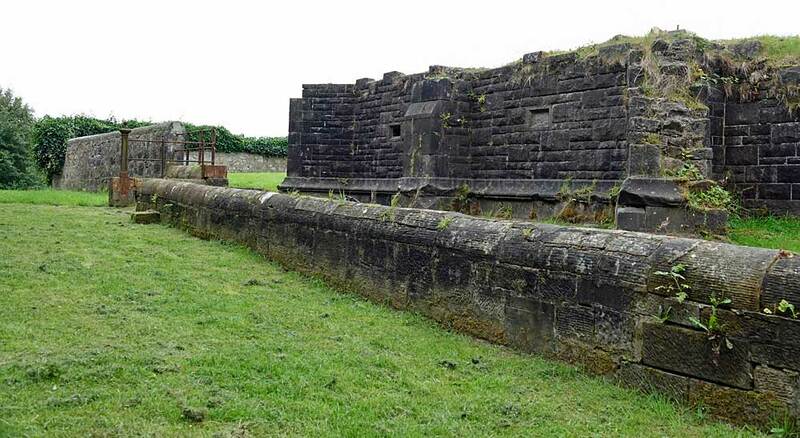 St Conval founded the original church on the banks of the Black Cart Water in 597AD which was later given to the Knights Templar by King David I (1124-53). 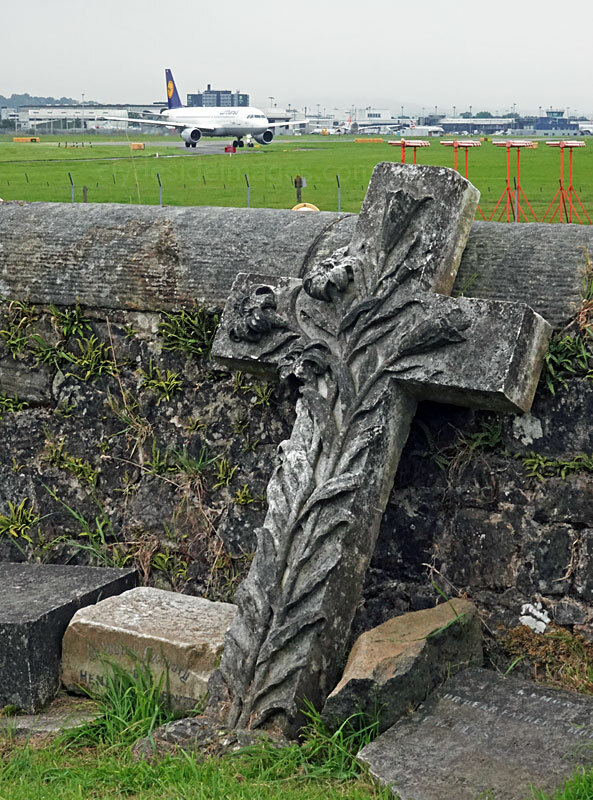 This building was demolished in 1828 and its replacement, built in 1900, was the church demolished to make way for the expansion of Abbotsinch airport. 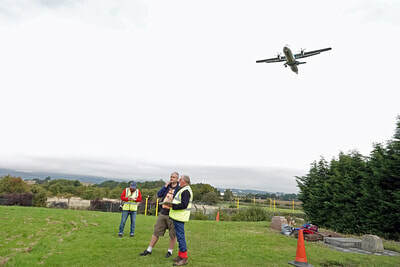 The weather wan`t great for the event on Saturday 8 September but it stayed dry until the afternoon so there was a steady turnover of visitors which was good to see. Volunteers were on hand to answer any questions on the history of the site but most people were really only interested in the planes! 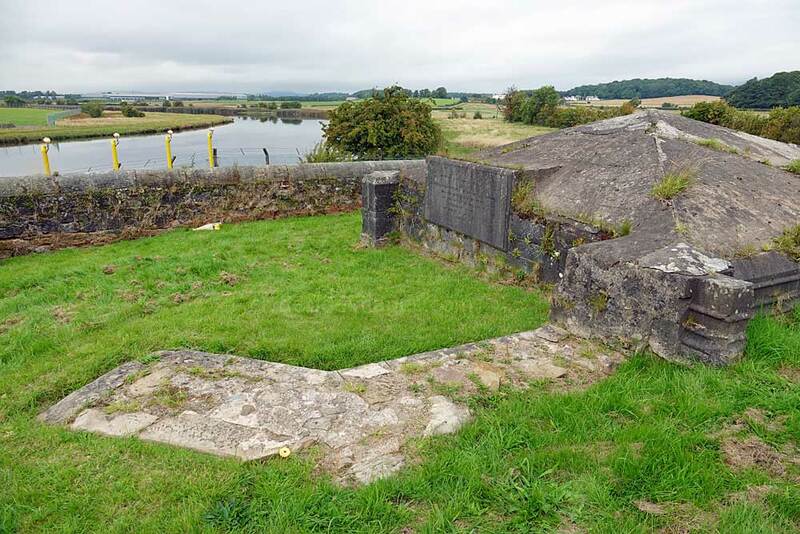 A number of grave slabs and parts of a monolithic cross, dating from somewhere between the 10th and 12th centuries, were removed before the old church was demolished and transferred to Inchinnan Parish Church in the nearby village where they were placed in a covered enclosure outside and can be viewed at any time. 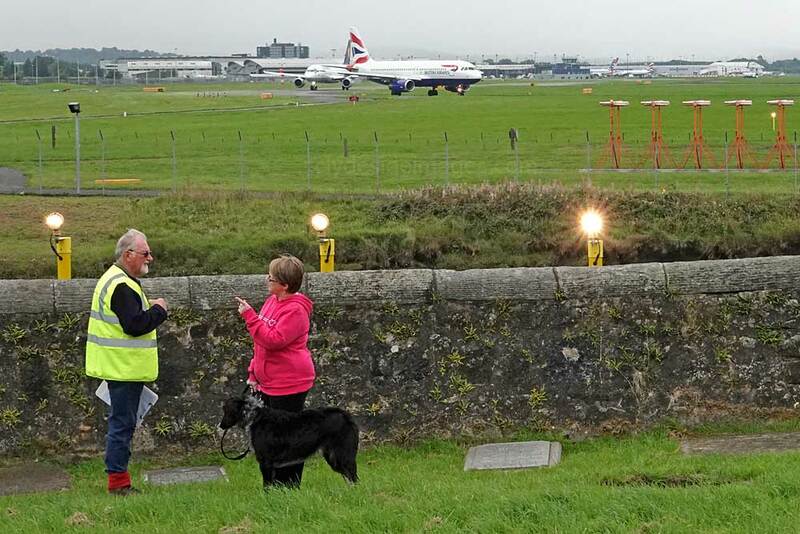 The main crypt here is the last resting place of several members of the Blythswood family. 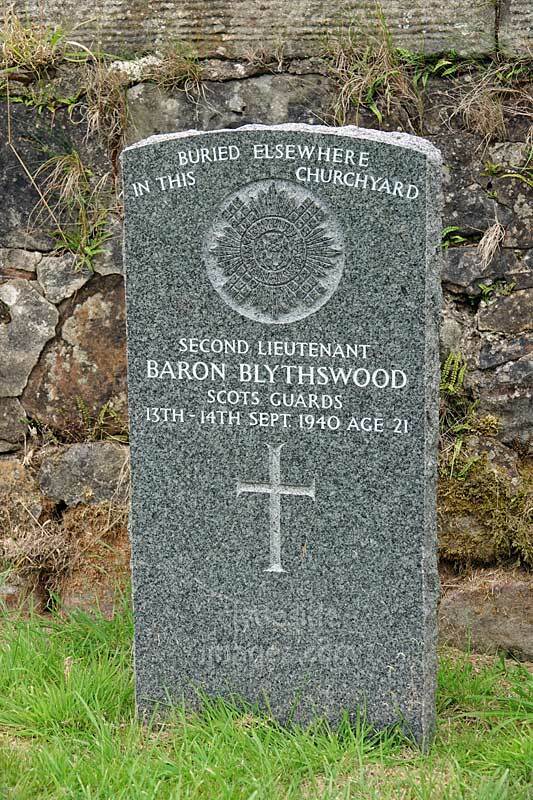 The headstone below, which bears a Regimental Crest, honours Second Lieutenant Baron Blythswood of the Scots Guards who lost his life during the Second World War. 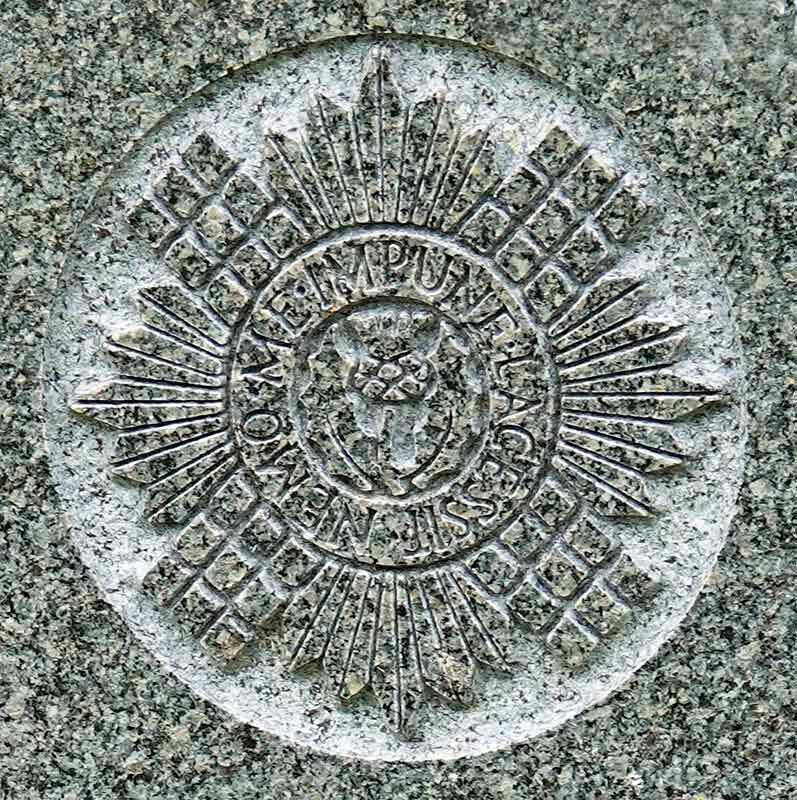 He was not killed on active service but died tragically as a result of a car crash in September 1940. 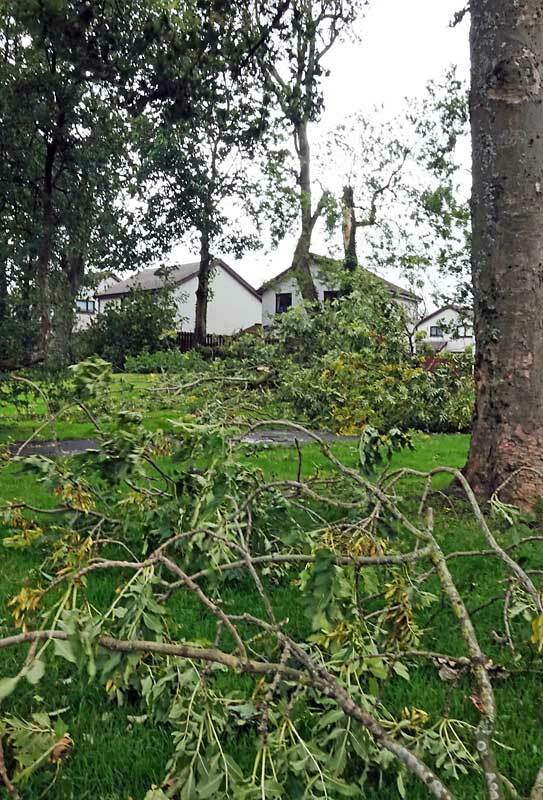 Tens of thousands of homes were left without power and many lorries overturned causing numerous lengthy delays. 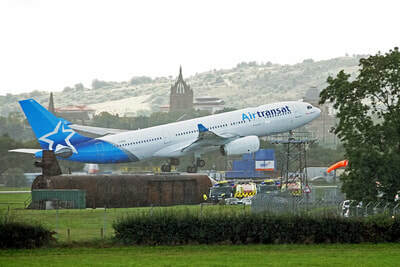 The extent of the storm was well illustrated at Greenock on the Clyde where the cruise ship Nautica, which had 478 passengers and 26 crew on board, broke its moorings and had to be assisted by several local tugs. 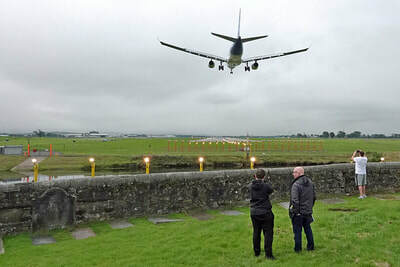 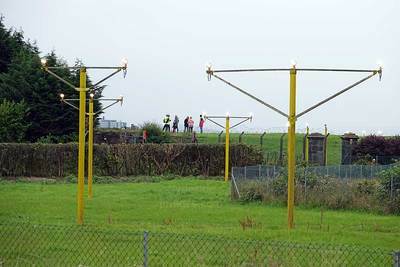 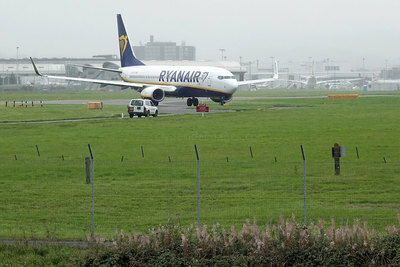 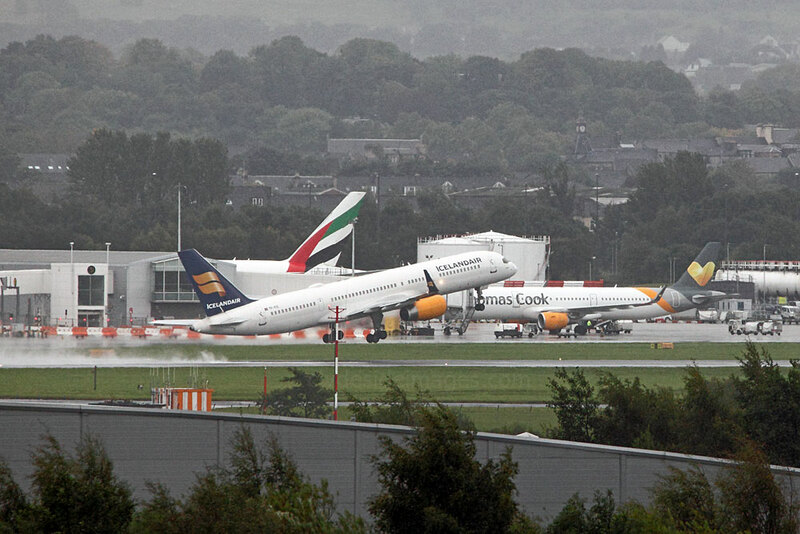 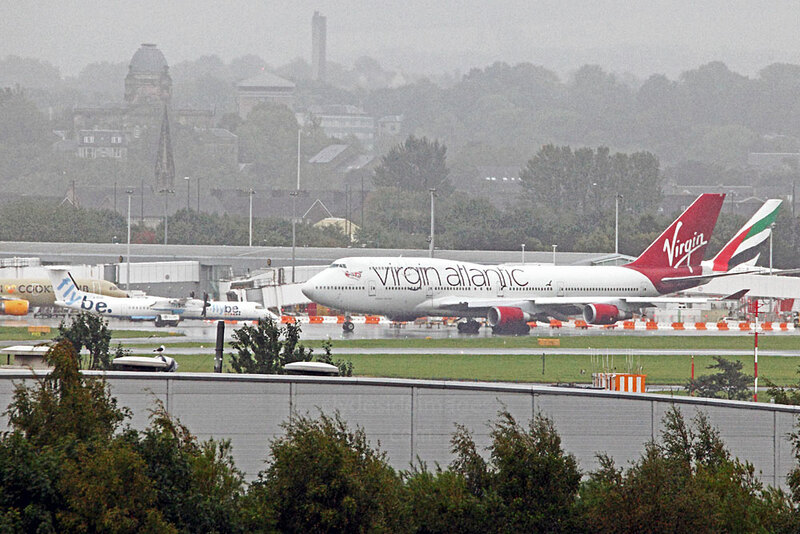 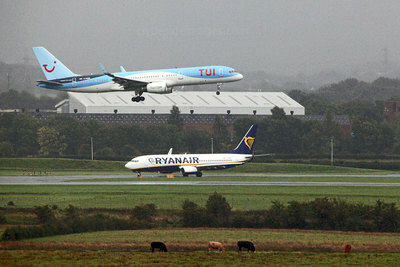 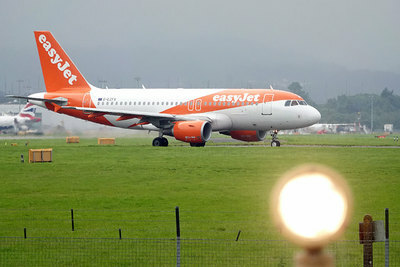 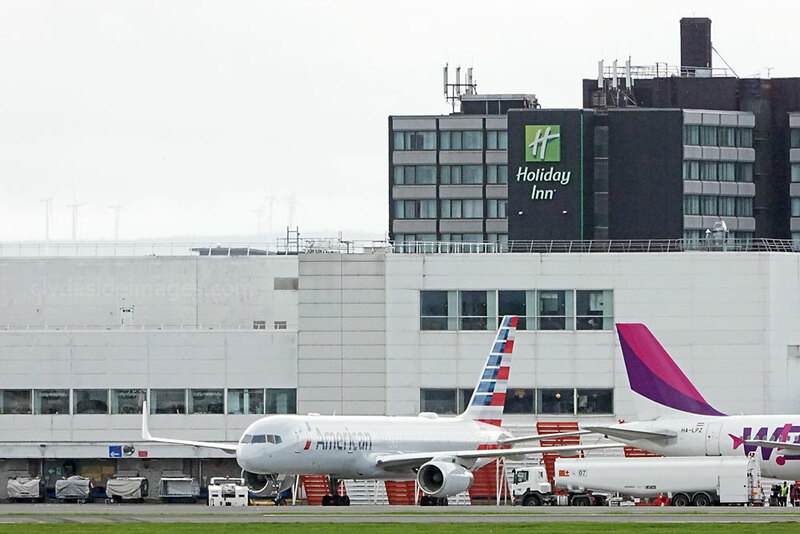 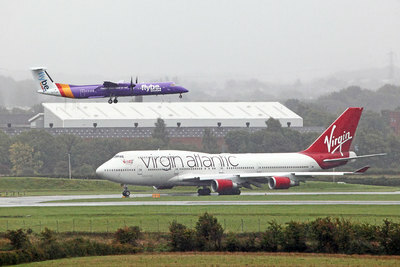 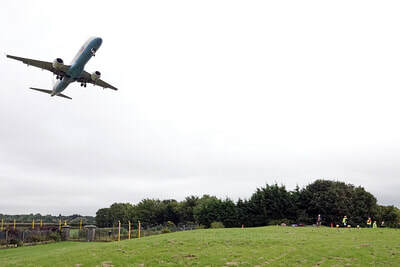 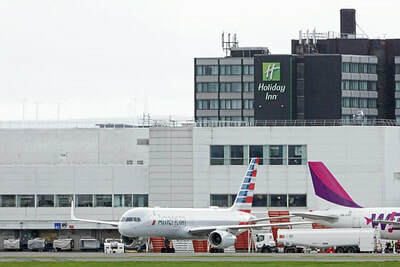 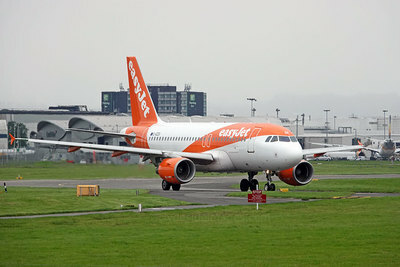 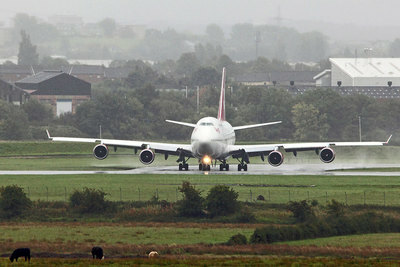 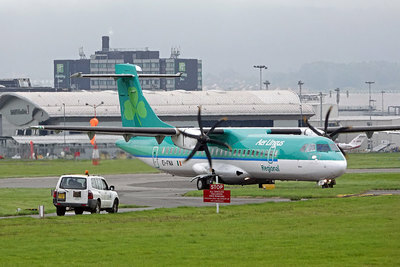 ​Seventy flights were cancelled at Dublin Airport with another dozen diverted. 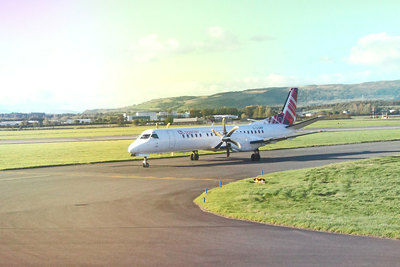 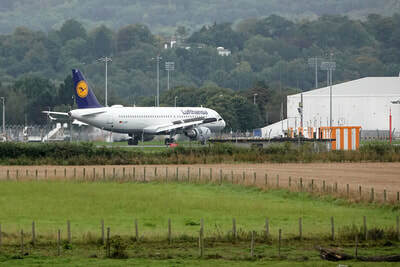 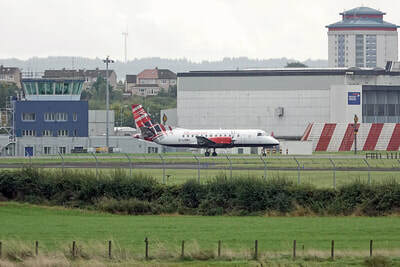 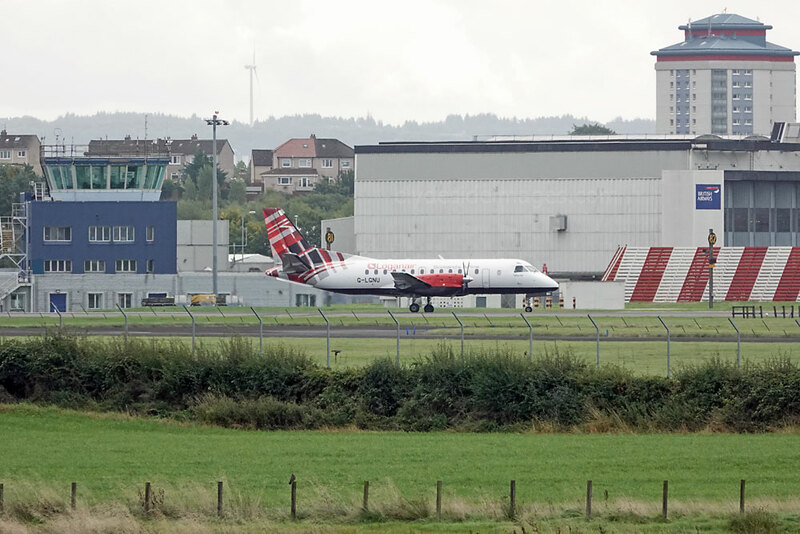 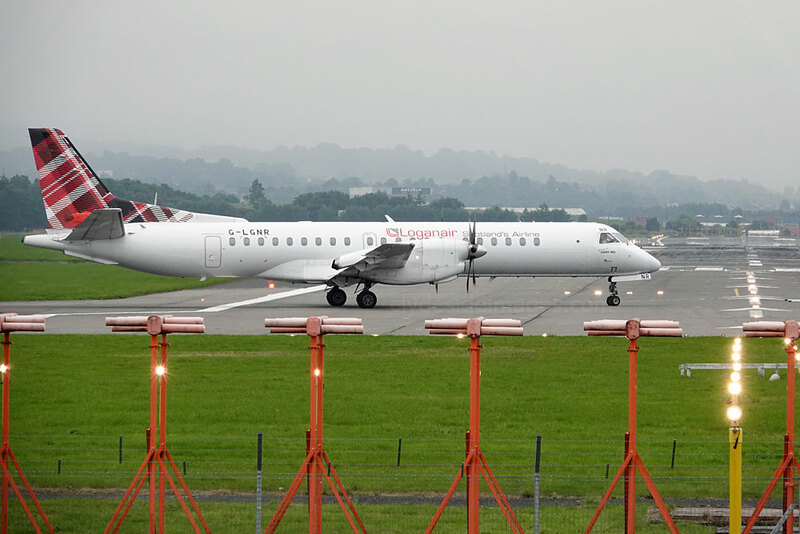 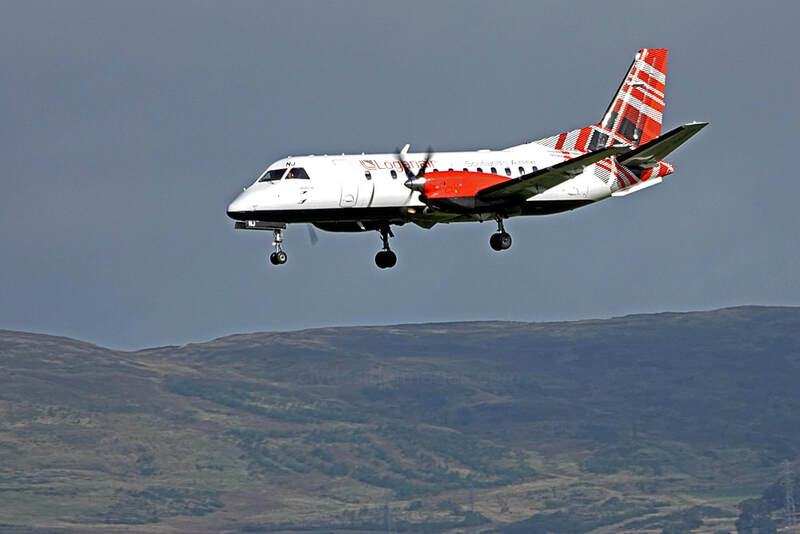 Prestwick and Glasgow International also saw cancellations and diverts including the daily Dusseldorf - Glasgow Eurowings Dash 8 which gave up after a hair-raising approach and returned to Dusseldorf. 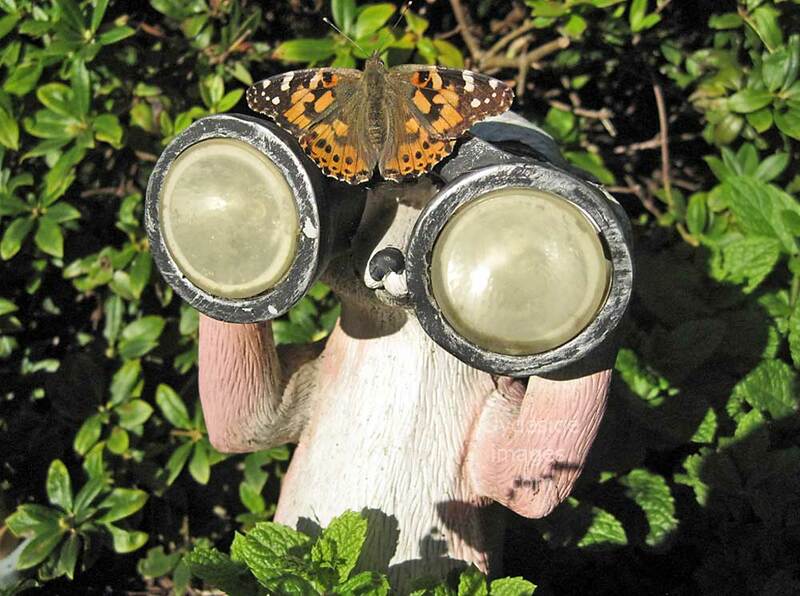 Within a couple of days, however, sunny spells brought out the last of the summer`s butterflies including this Painted Lady which settled on my garden Meerkat`s binoculars. 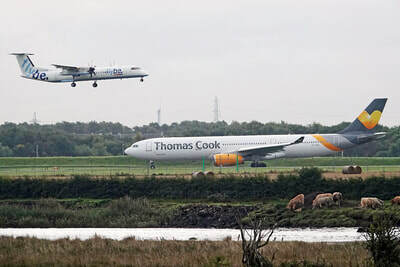 This proved to be a great omen, as my wife and I set-off for our third holiday in Namibia later that week, concentrating on wildlife viewing and photography. ​Previously I`d flown with British Airways via Heathrow and Johannesburg but KLM have recently introduced a direct flight from Schiphol to Windhoek. 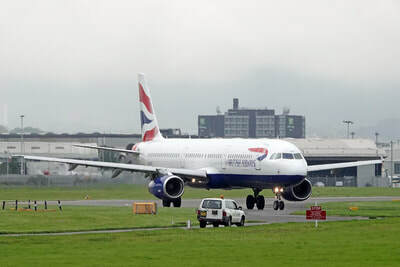 This is by far the better option and an added bonus for aviation enthusiasts is that the aircraft, in my case an Airbus A330-300, stops in Luanda, Angola, to refuel and take on additional passengers. Those already on board remain on the plane but I had a window seat so managed a few grainy shots, mainly during take-off and landing. 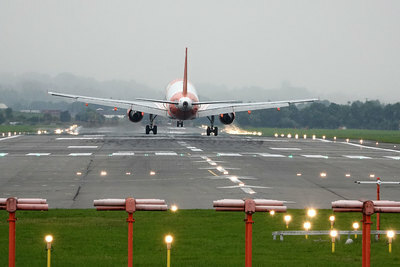 It was dark when we touched down there on the way back though. 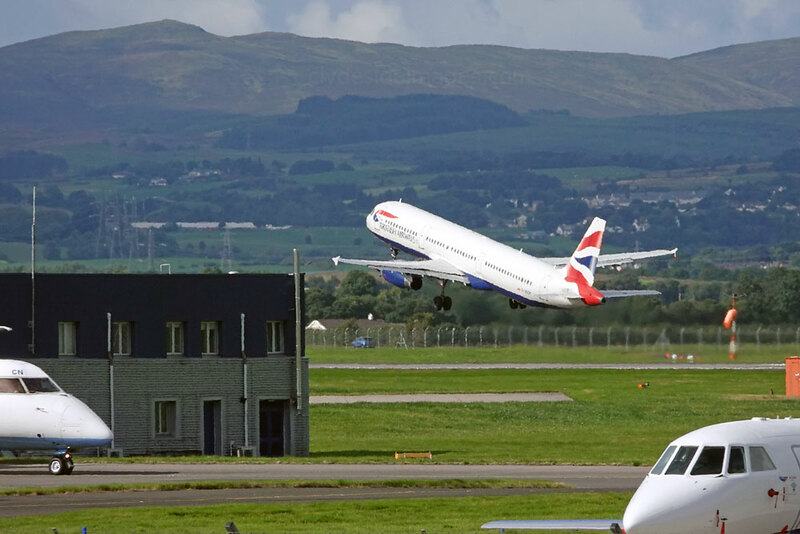 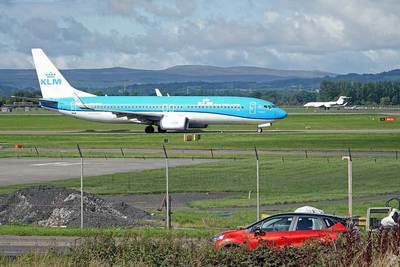 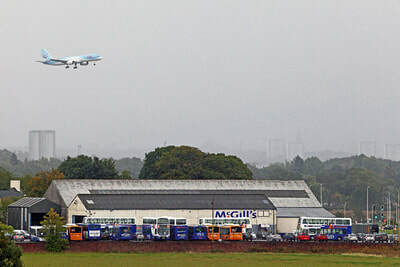 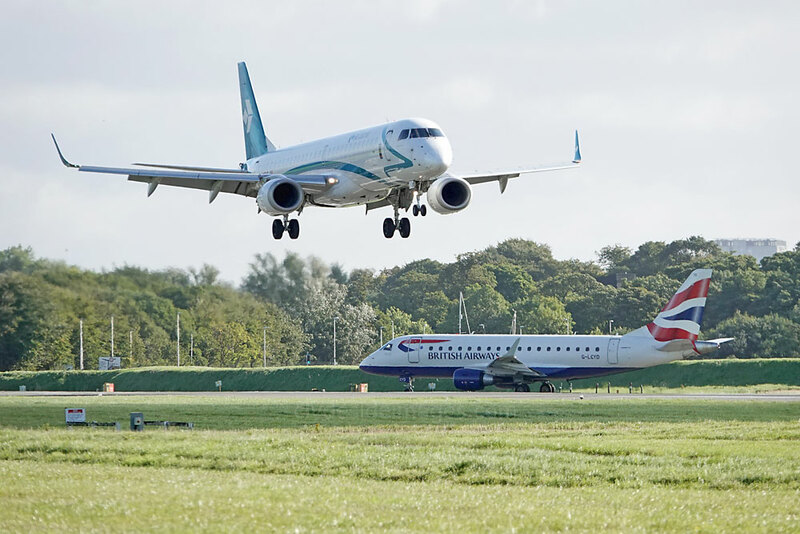 ​The above shot was taken at Glasgow on 23 September from my Amsterdam-bound Boeing 737 which took off from `Bravo One` ahead of Challenger 604 N637TF. 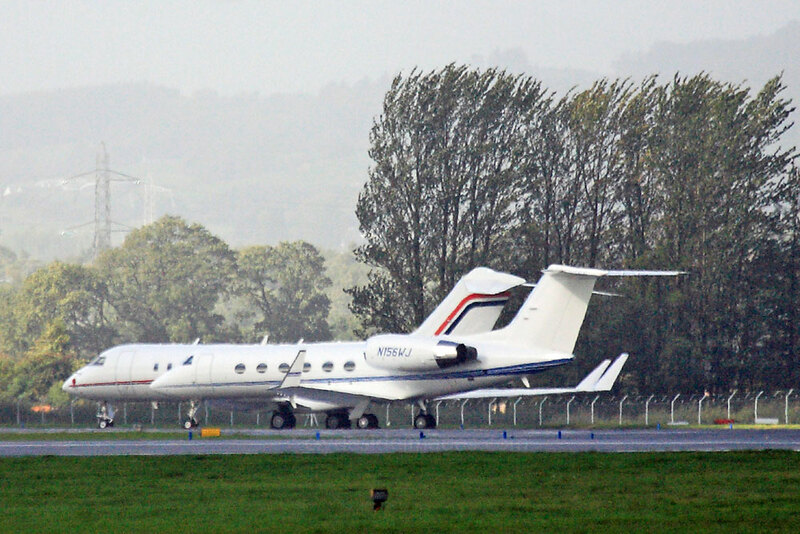 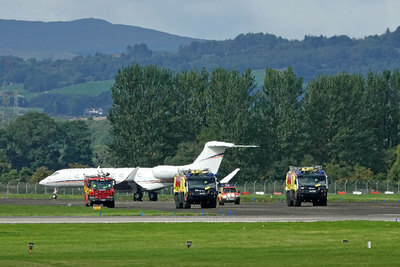 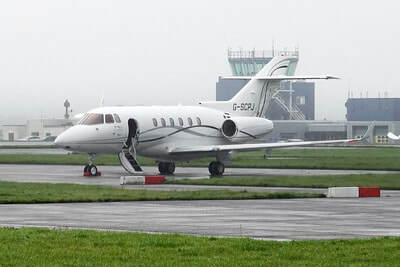 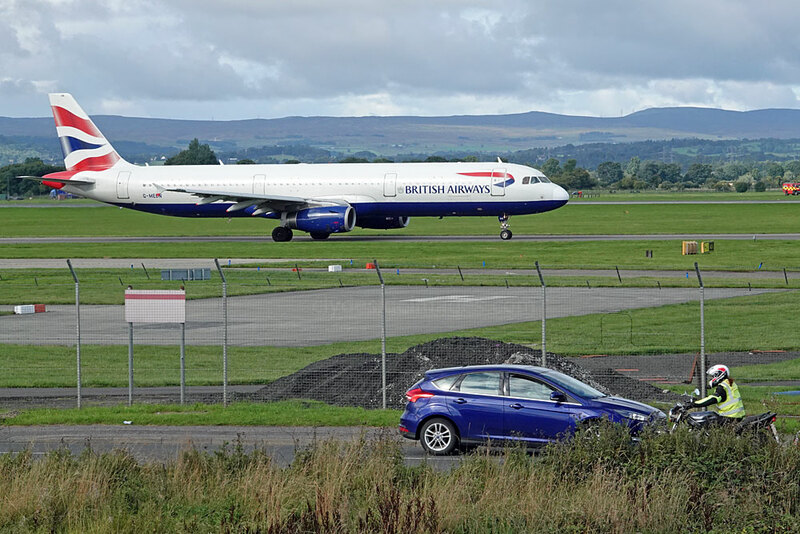 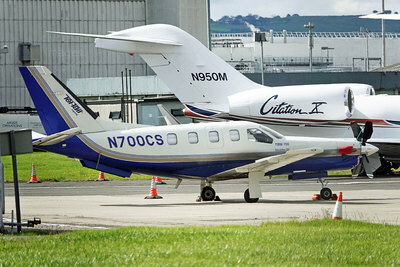 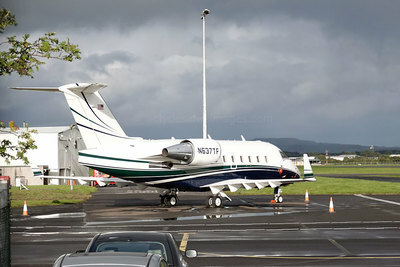 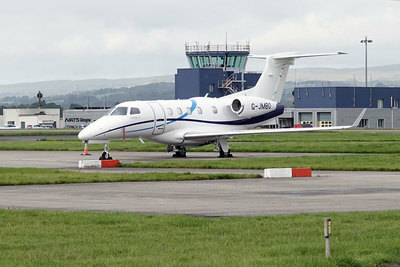 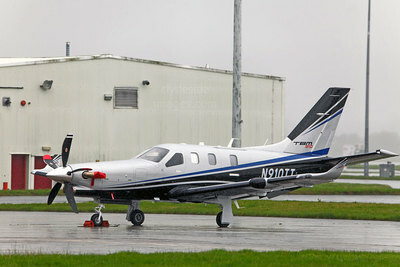 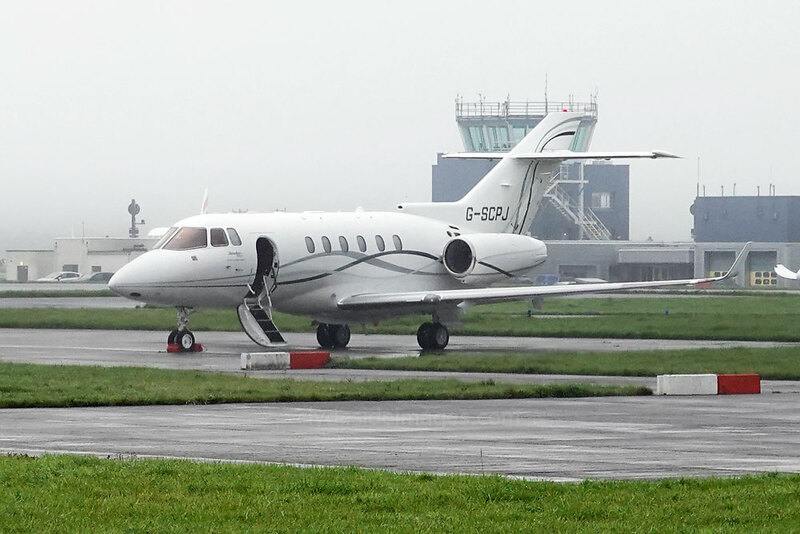 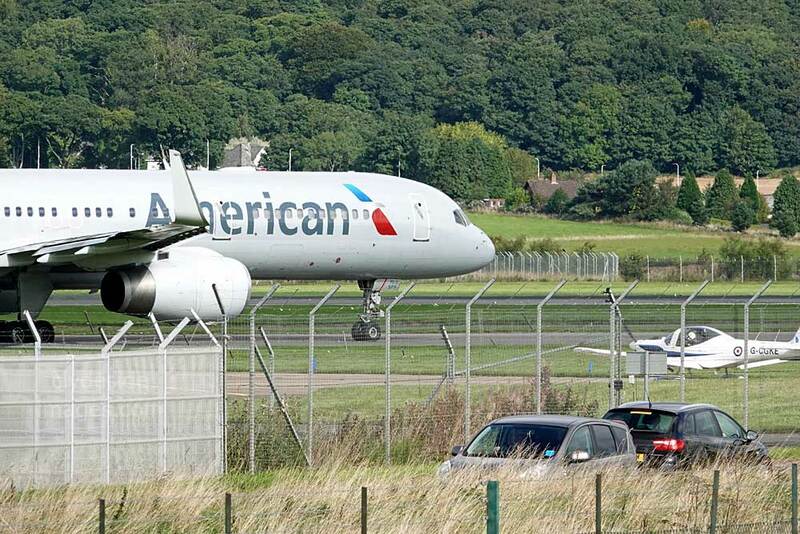 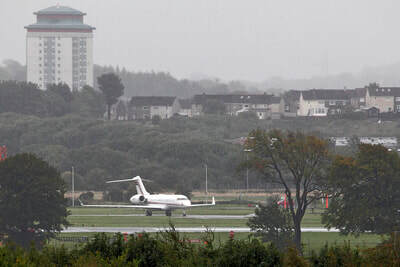 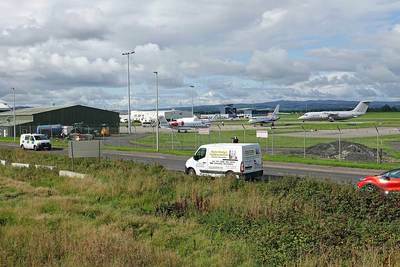 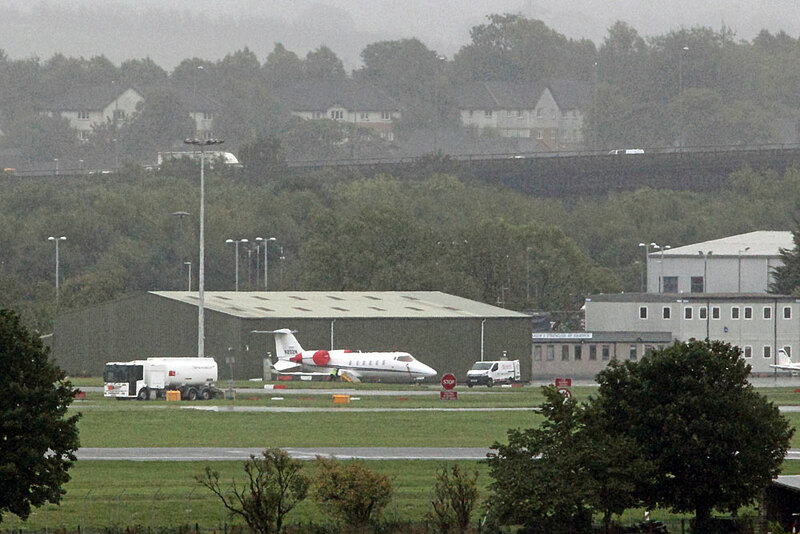 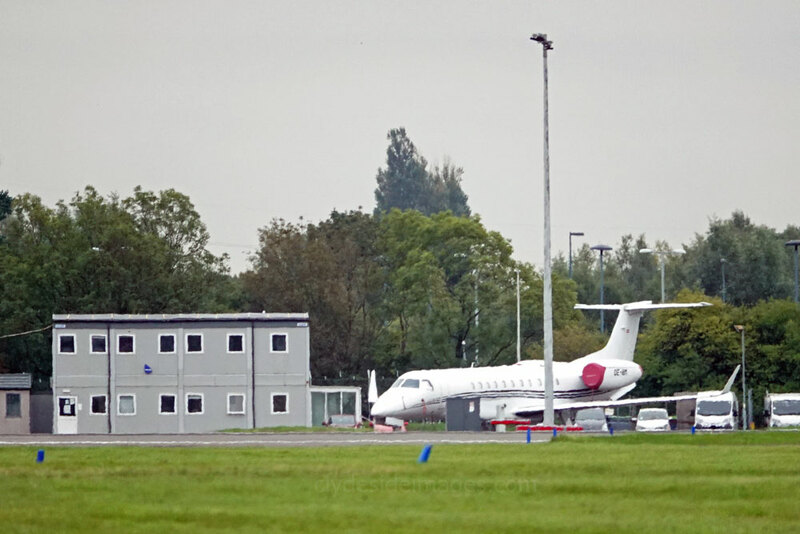 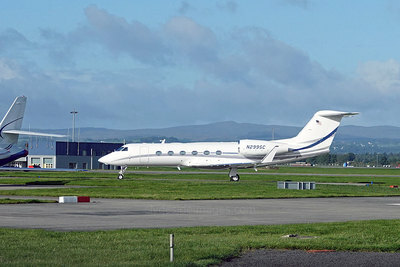 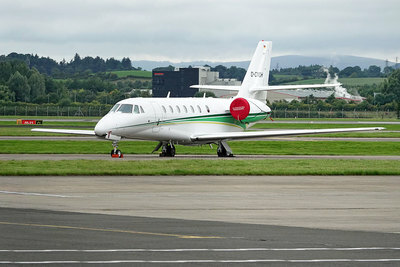 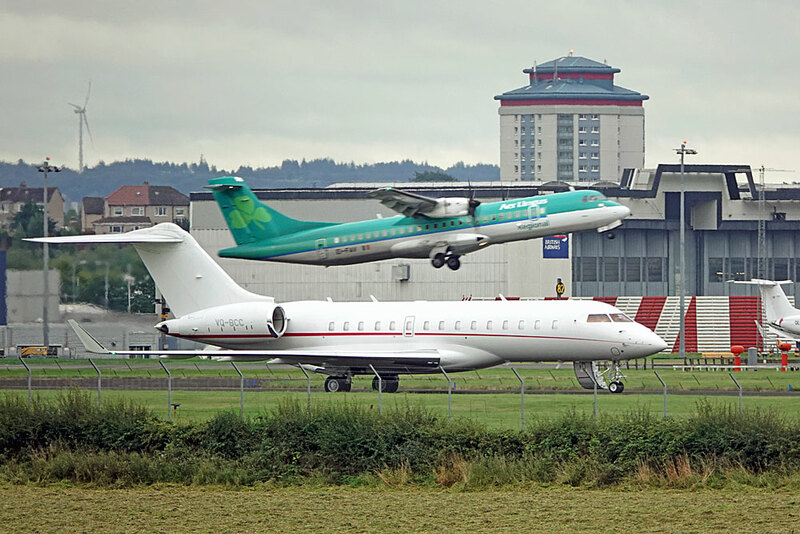 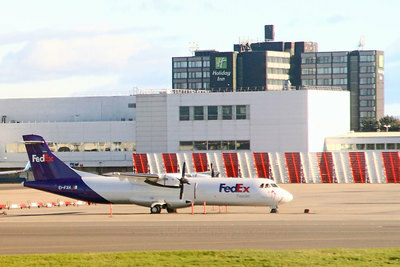 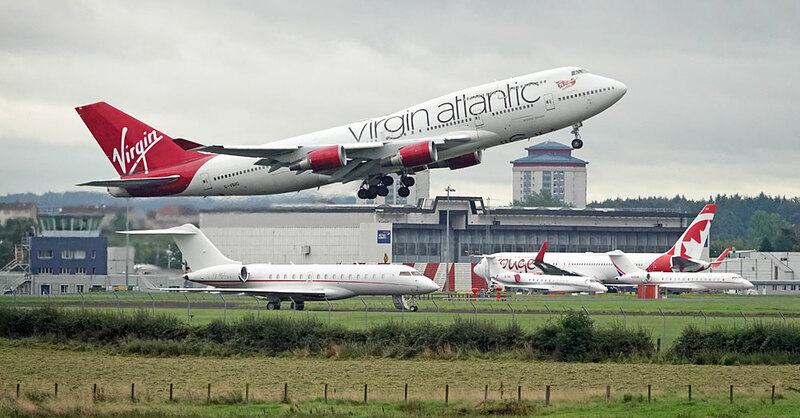 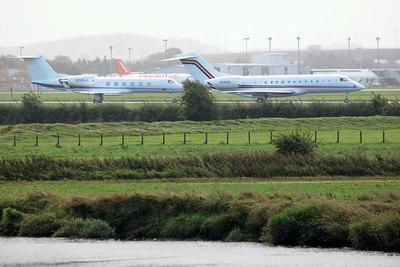 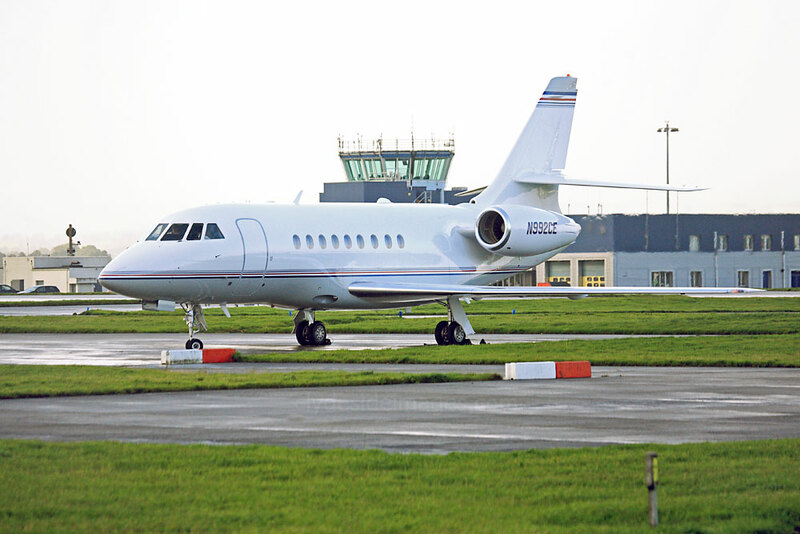 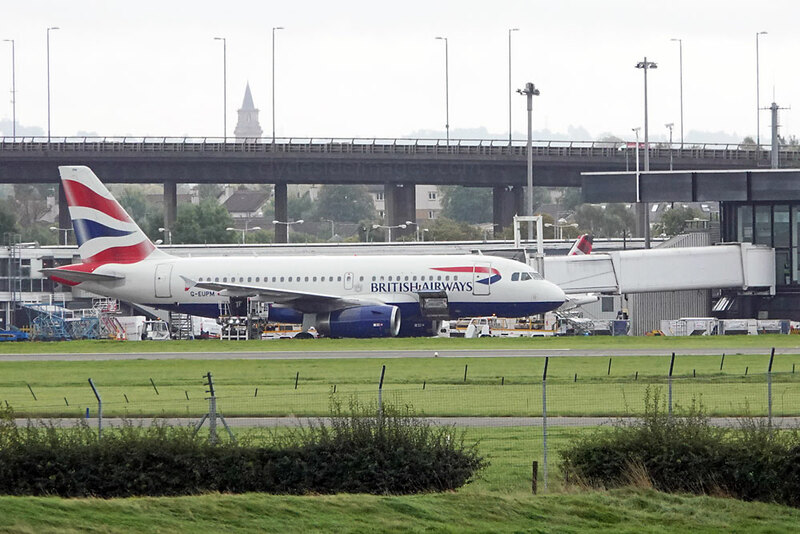 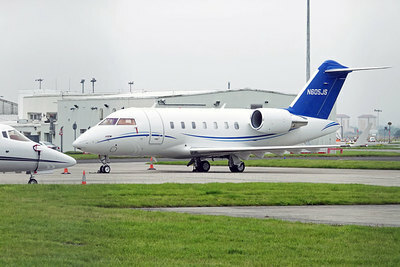 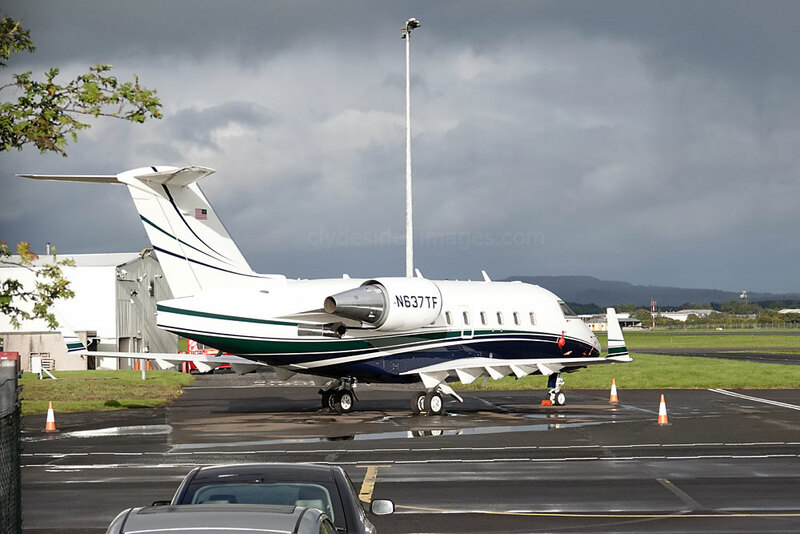 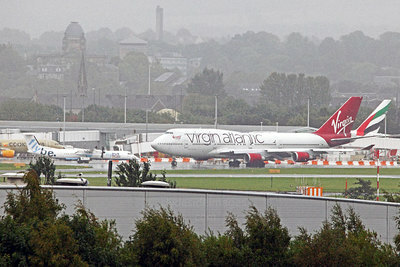 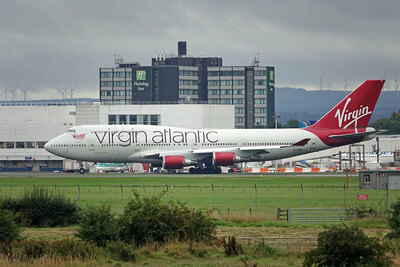 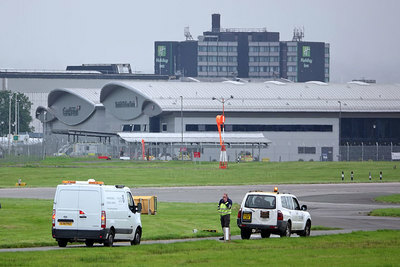 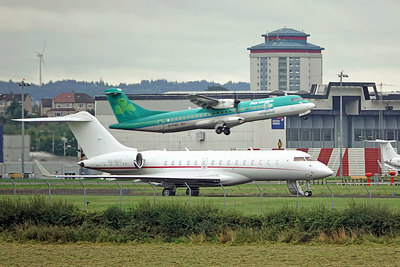 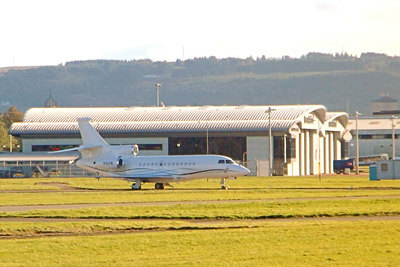 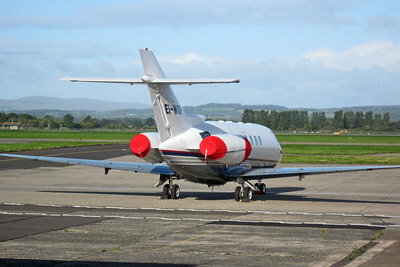 The US-registered biz-jet had arrived at Glasgow International on the 20th, parking up on Area Juliet. 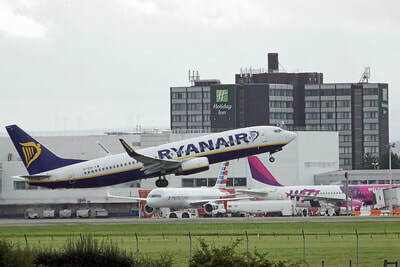 By the time I arrived at Schiphol the light was fading and there wasn`t much to see, just a selection of Boeing 737s, Airbuses and Embraer Regional Jets. 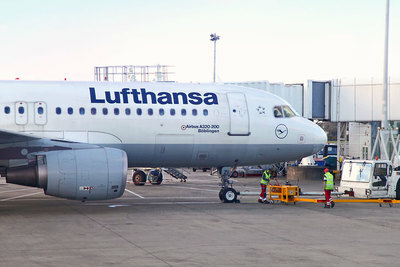 Eurowings Airbus A320-214 D-ADBU is pictured below. 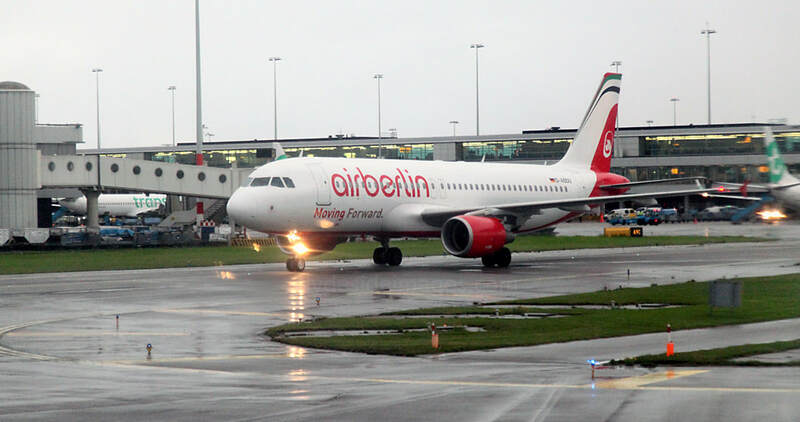 This airline has taken delivery of its last of 77 former Air Berlin aircraft, namely another A320 which entered service on 27 August. 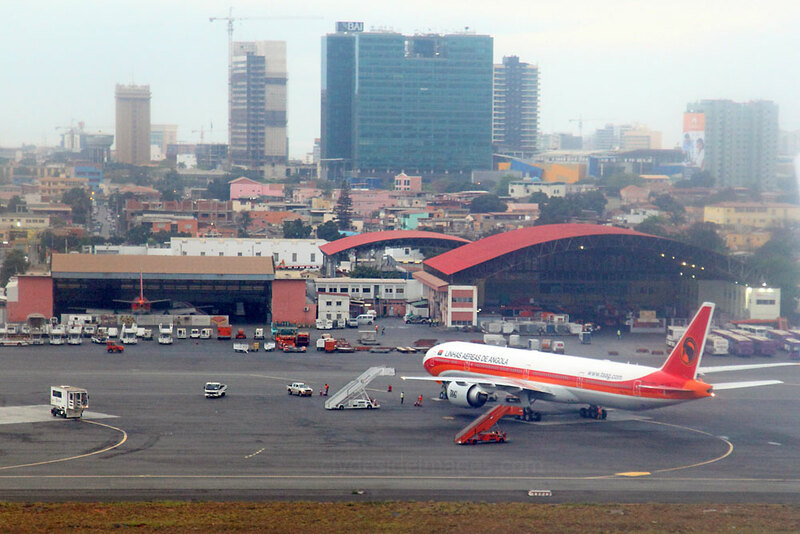 ​I took the following shots of Luanda Airport from our KLM A330. 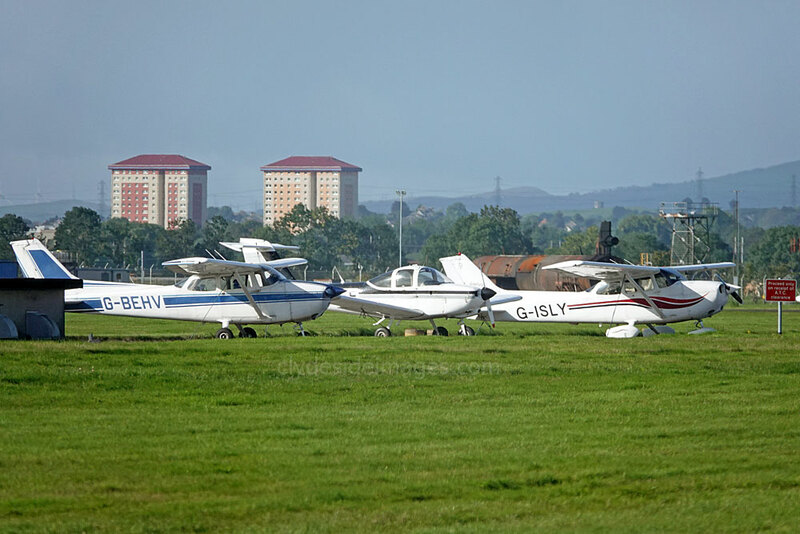 I didn`t note any serials or registrations but it`s clear that this is a large and very busy international airport with an interesting mix of civilian and military aircraft, both fixed wing and rotary. The units at the military base operate mainly Soviet types which rack up a large percentage of movements each year. 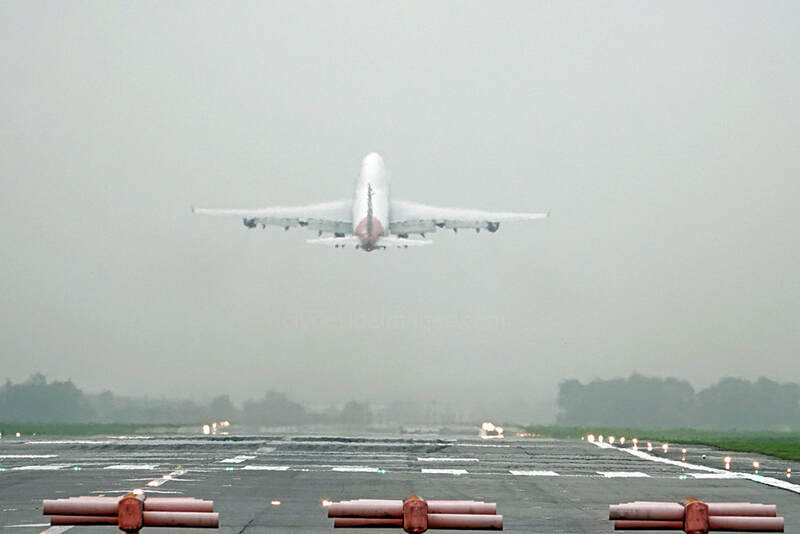 More photos and further information on Angola`s main airport can be found here. 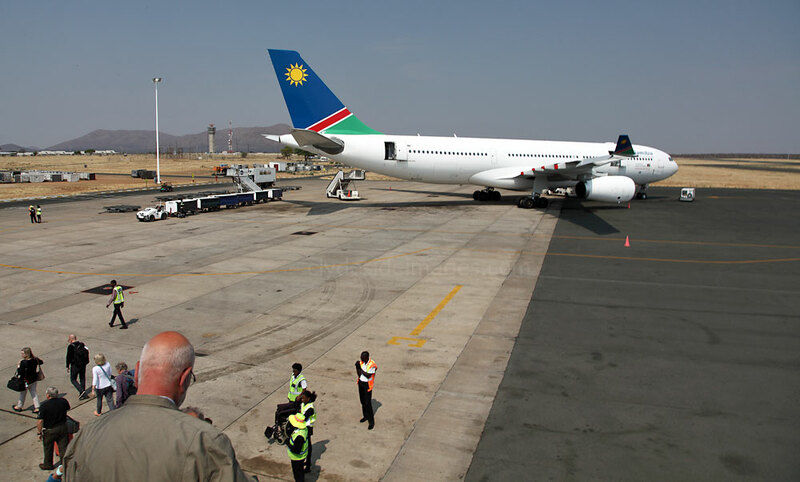 Hosea Kutako International Airport (IATA: WDH) is the main international airport of Namibia, and is located approximately 45 km east of the capital city Windhoek. 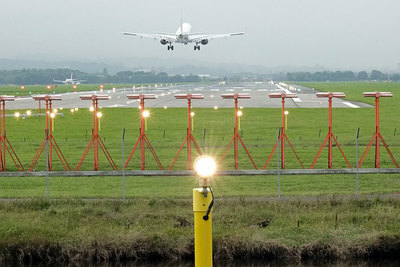 The airport was opened in 1965 during the era of South African administration, and was then named J.G. Strijdom Airport, after the Nationalist Prime Minister of South Africa. 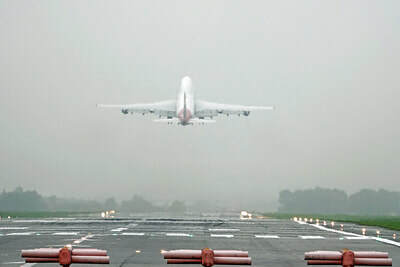 It was renamed Hosea Kutako International Airport following independence in 1990. 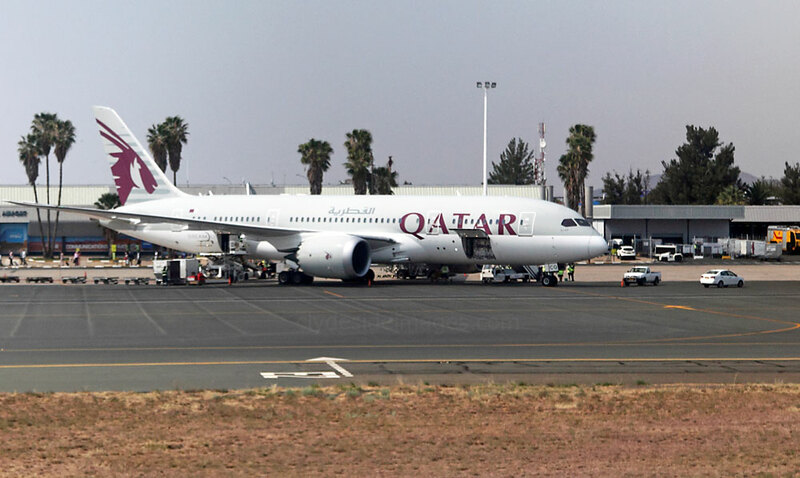 For Namibia`s largest aerial gateway, Hosea Kutako Airport seem more like a relatively small regional airport and can quickly become congested with incoming and outgoing passengers if several wide-bodied aircraft are on the ground together. 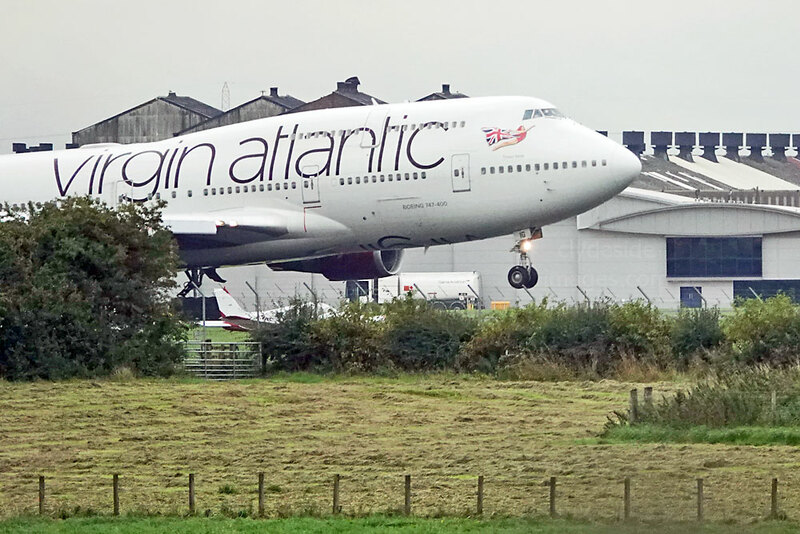 I`ll start off this section with more shots of Virgin Atlantic`s `Pretty Woman` taken from the old churchyard grounds on Saturday 8 September. 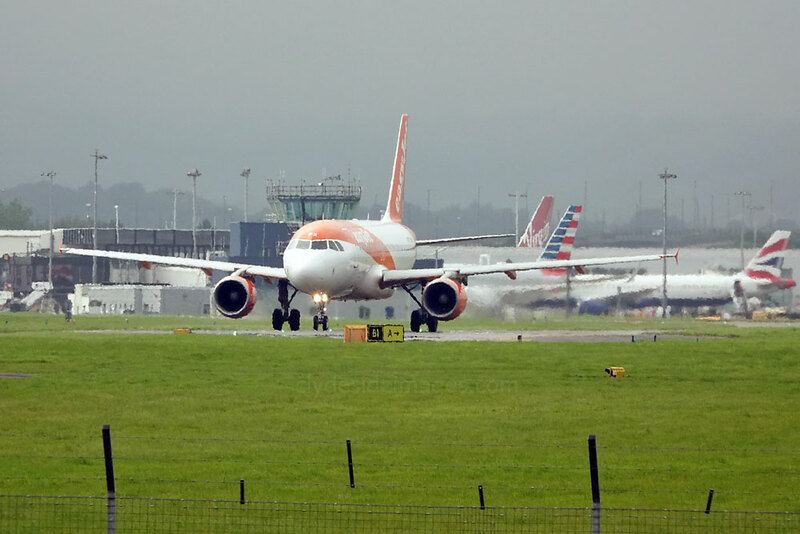 With Ryanair set to drastically wind down operations at Glasgow International soon, and American Airlines bailing out permanently as of late September 2019, there was some good news for change with Jet2 announcing that it will create 300 jobs in Scotland as part of its expansion plans. 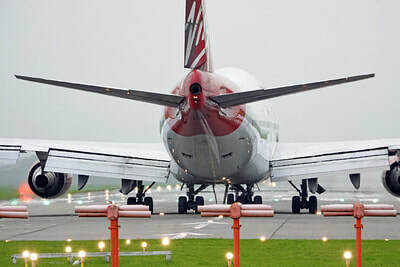 However, this figure includes a large number of current staff who are filling seasonal positions. 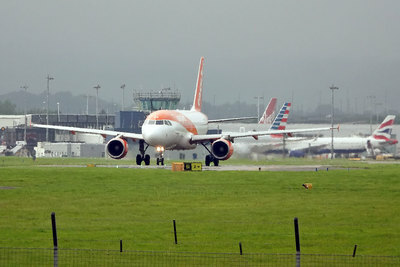 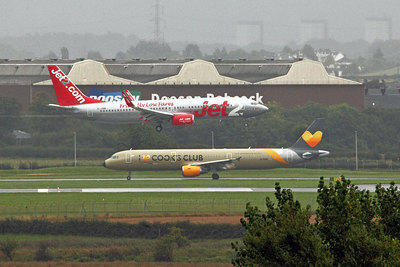 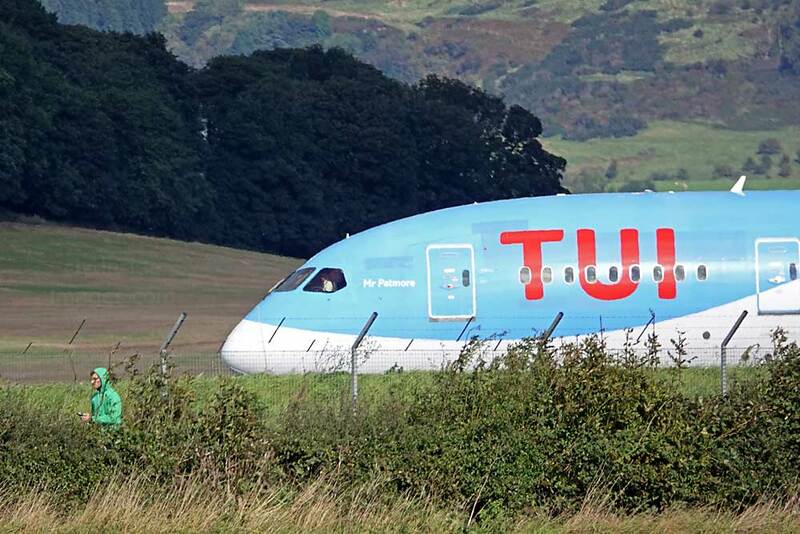 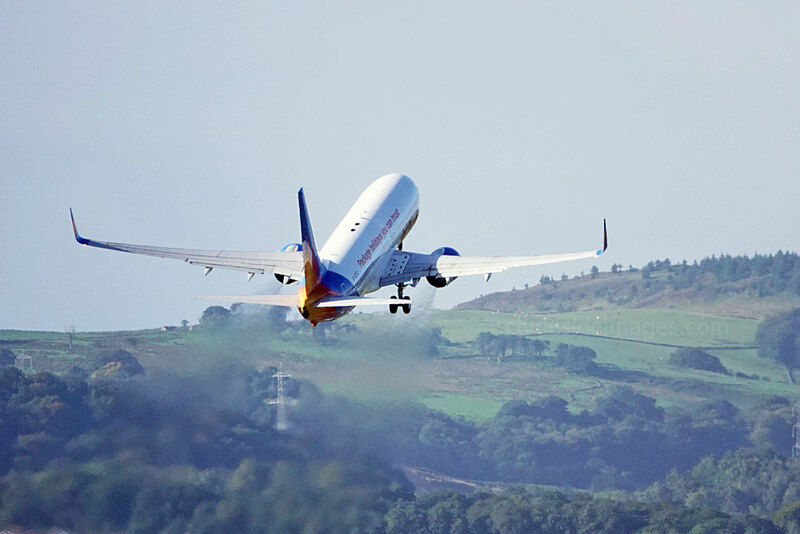 Jet2.com and Jet2holidays plan to increase capacity at Glasgow and Edinburgh next summer which will see the carrier between the two airports offer more than 1.7 million seats. New destinations for 2019 will be Bourgas in Bulgaria from Glasgow and Edinburgh, and Izmir in Turkey from Glasgow. More than 150 cabin crew and more than 100 ground operations staff will be recruited, along with experienced pilots. 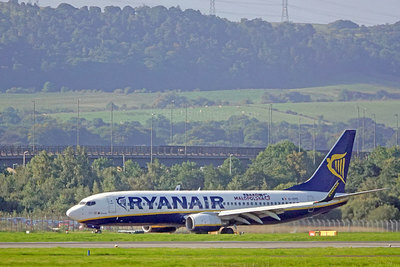 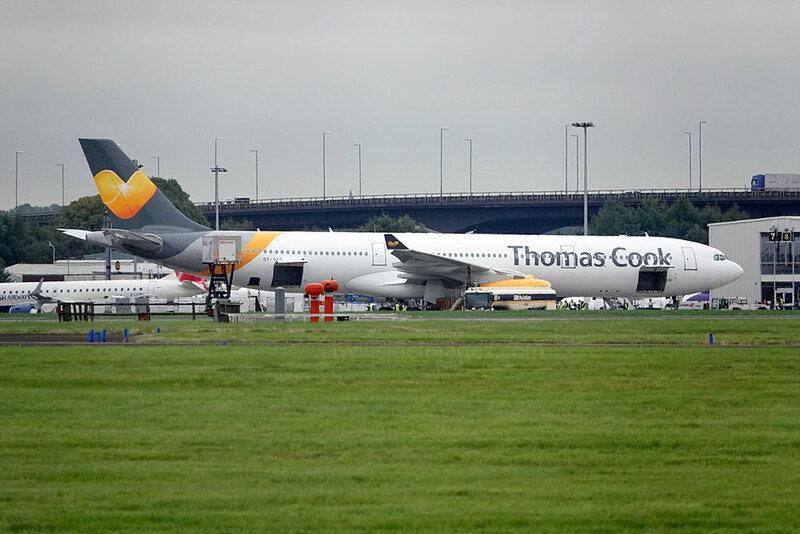 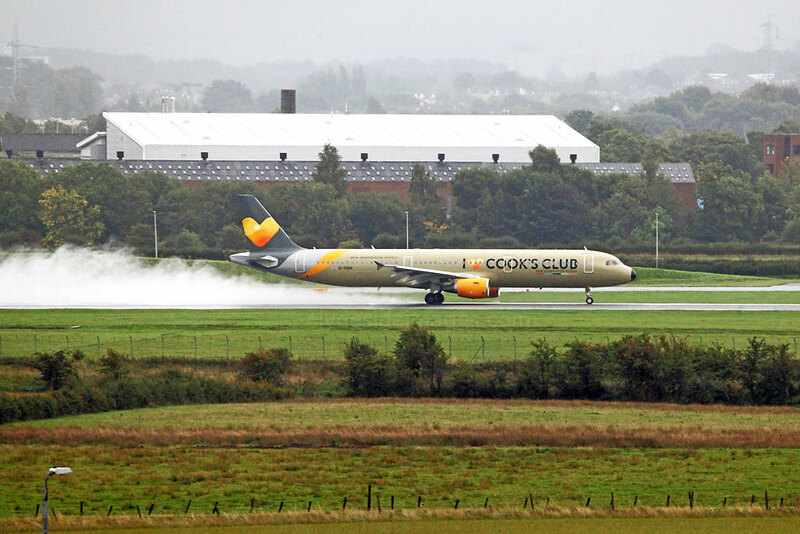 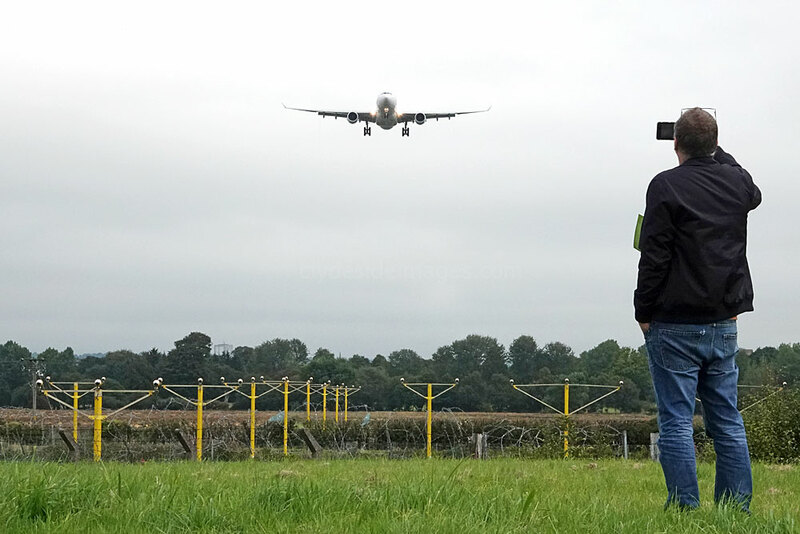 This move should hopefully lessen the detrimental impact caused by the projected downturn in passenger figures, particularly following Ryanair`s departure. 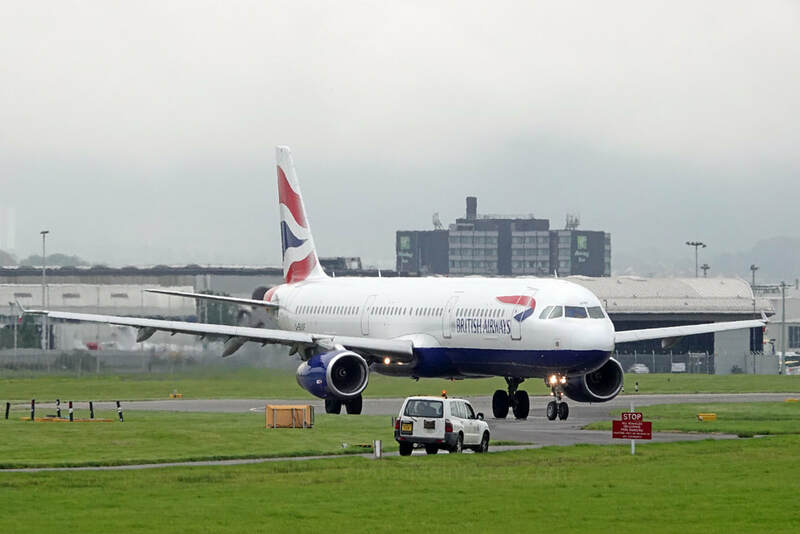 Earlier this month, British Airways was forced to apologise following a sophisticated 15-day breach of the firm's online security systems. 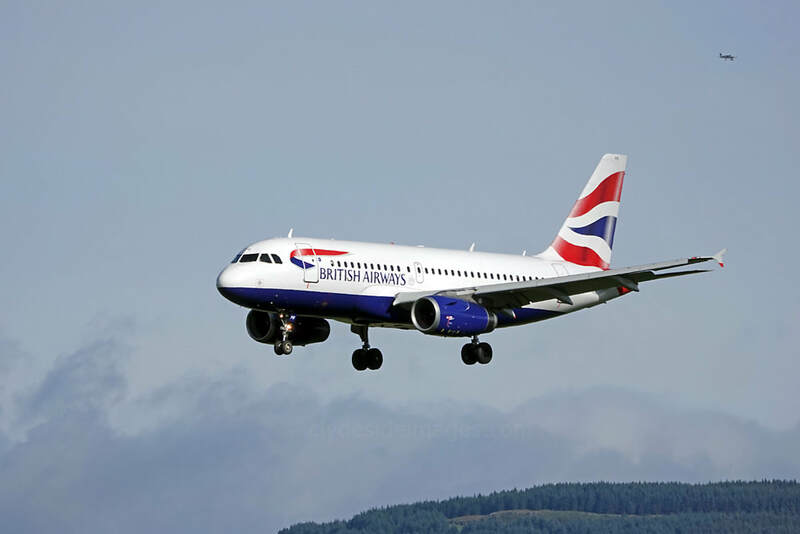 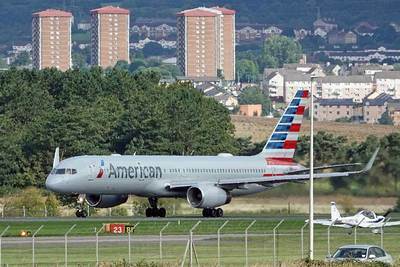 The carrier said personal and financial details of customers making or changing bookings on their website or via the BA phone app between 21 August and 5 September 2018 had been compromised and has promised compensation. 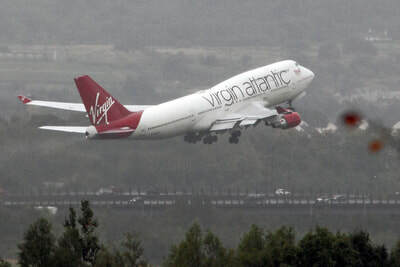 About 380,000 transactions were affected, and although the stolen data did not include travel or passport details, names, addresses, email and credit card details, including the 3-digit security number, were hacked. 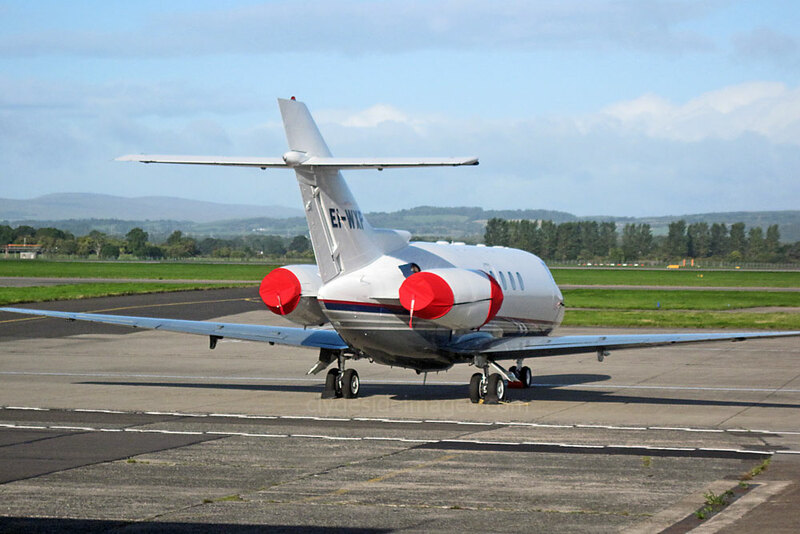 Both Rangers and Celtic were in action in Europe this month in the Europa League resulting in charter flights operated by Carrpatair, Germania, Jettime, Maleth-Aero, Nordwind and Privilege Style. 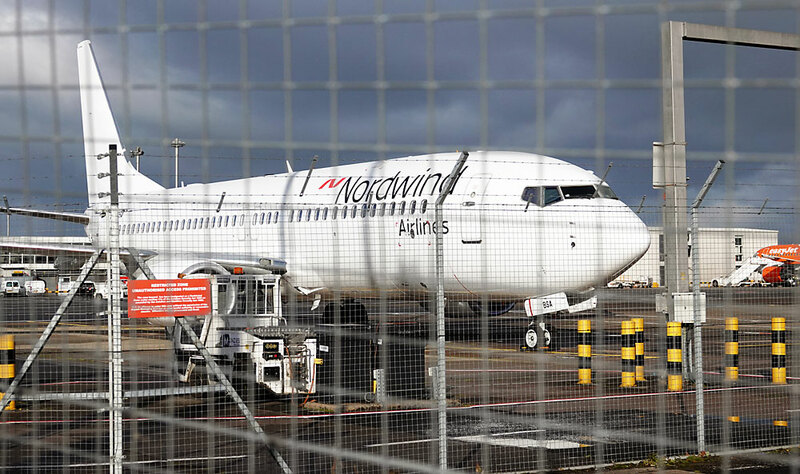 ​This was the best view of Boeing 737-800 VP-BSA B737-8 of Nordwind Airlines that I could manage. 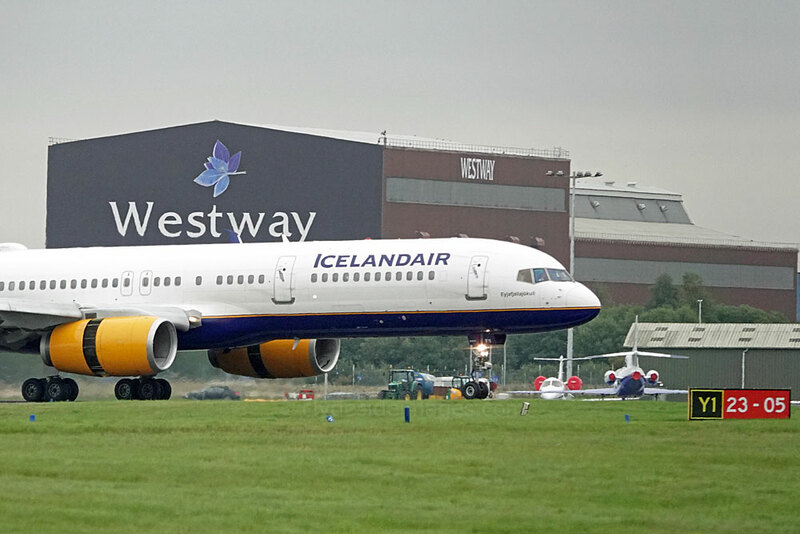 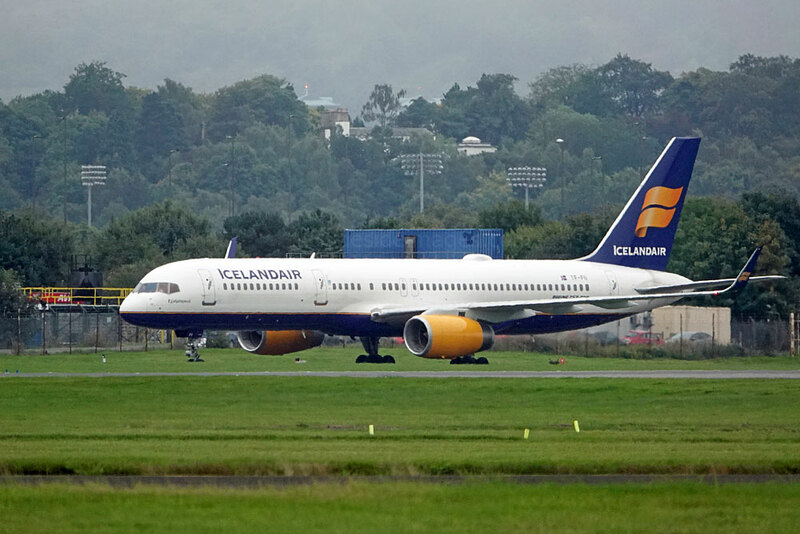 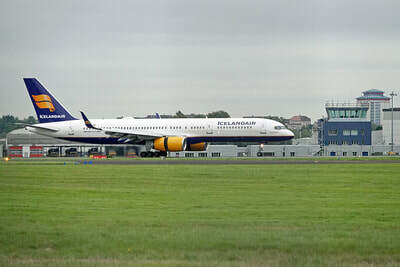 ​Boeing 757-3E7(WL TF-ISX Icelandair (100 Years of Icelandic Sovereignty livery), Boeing 737-8MG(WL) G-JZBO Jet2 (f/v) and Airbus A319-111 D-ASTJ Germania (f/v)(21st): Boeing 757-3E7(WL) TF-ISX Icelandair (100 Years livery) returned. 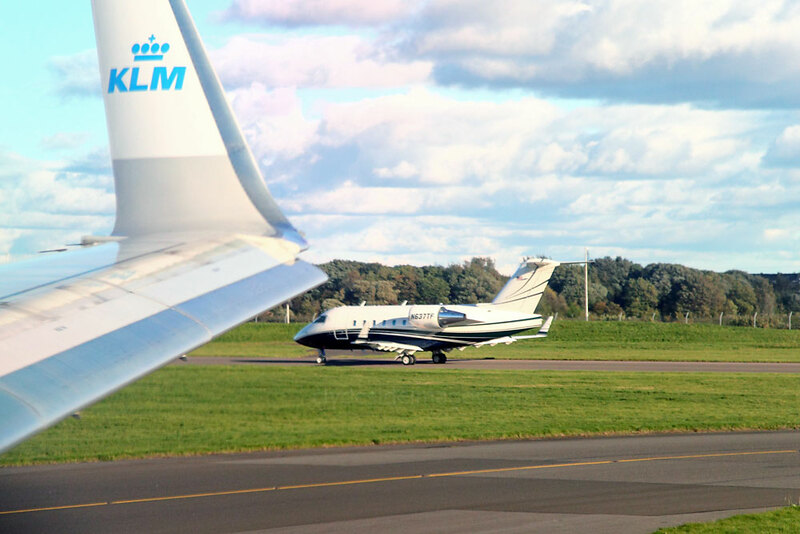 I flew out on KLM Boeing 737-8K2(WL) PH-HSD to Schiphol, to catch an overnight flight to Windhoek, Namibia (23rd); ​Boeing 737-8MAX A40-MD Oman Air (f/v) (on delivery - stopped overnight), plus Airbus A320-232 LZ-BHH BH Air (24th); ​Embraer ERJ-195LR I-ADJU Air Dolomiti (26th); Boeing 737-808 G-DRTD Jet2 (f/v) (29th); Boeing 757-223(WL) N198AA American Airlines. 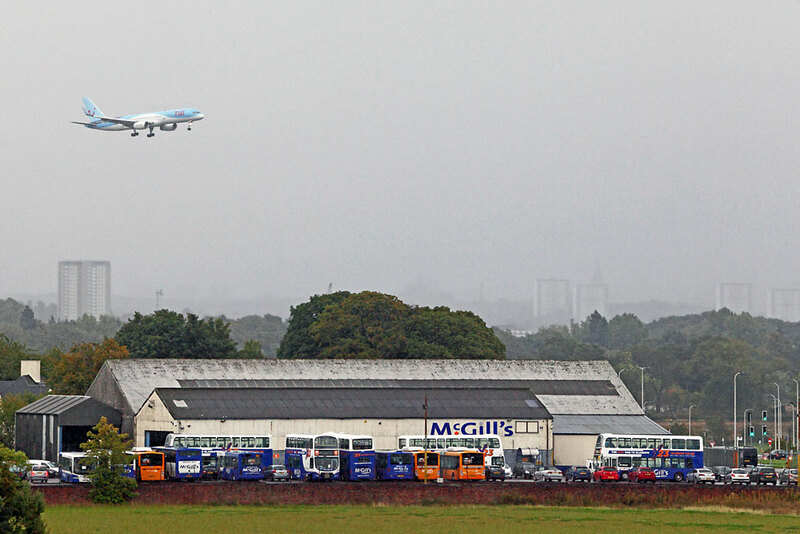 This was last ever seasonal daily Philadelphia - Glasgow service (30th). 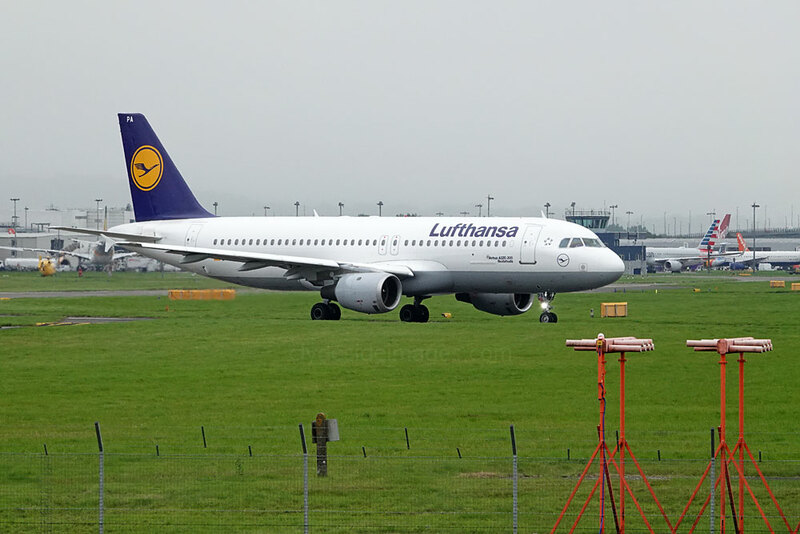 Another shot of Lufthansa A320-214 D-AIZI pushing back for the return flight to Munich on Sunday 23 September. 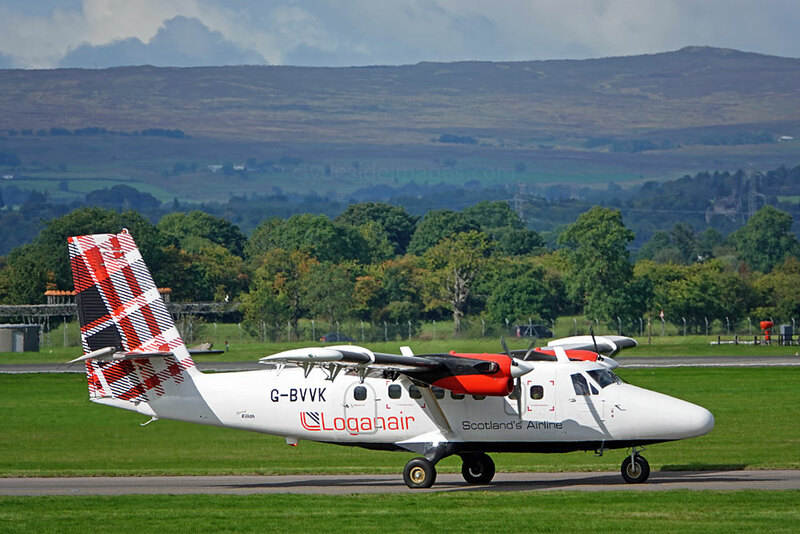 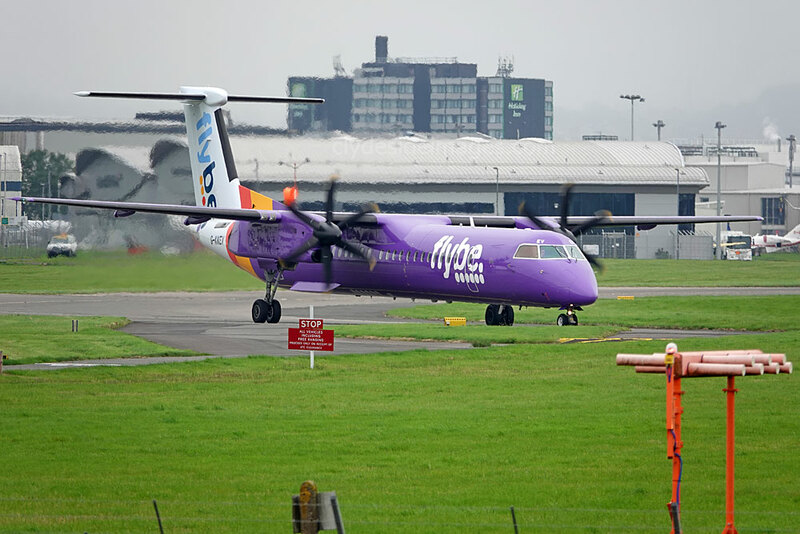 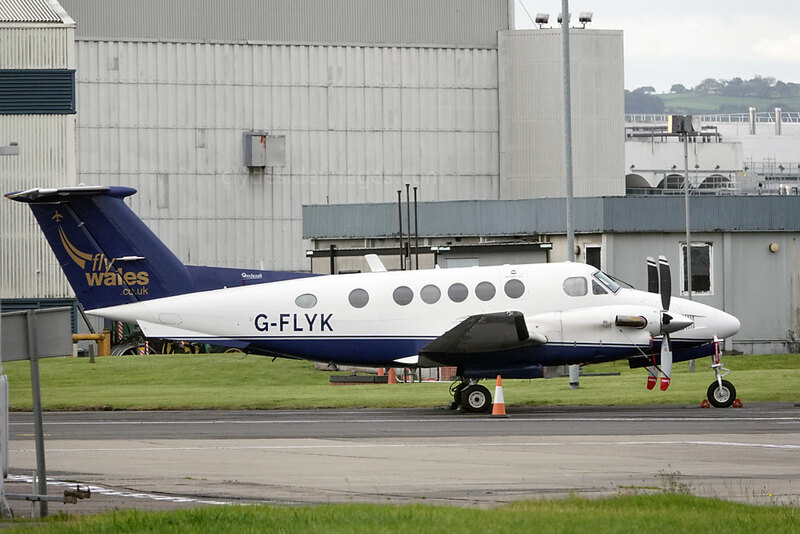 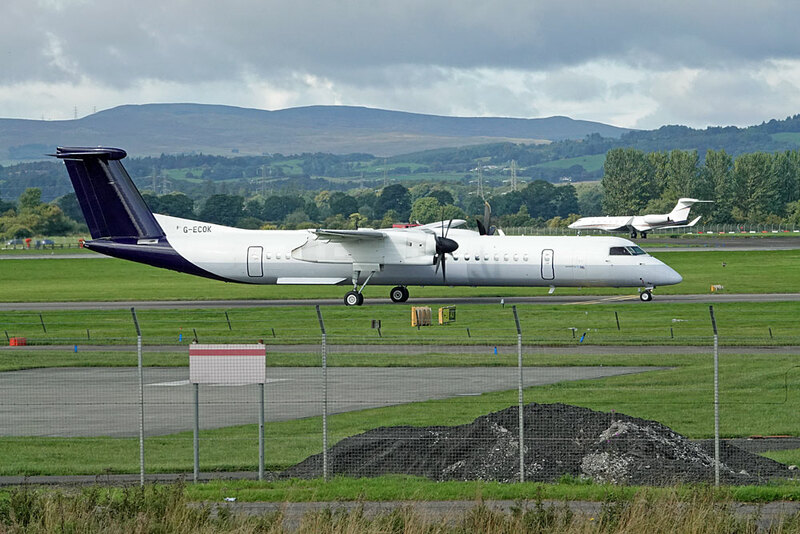 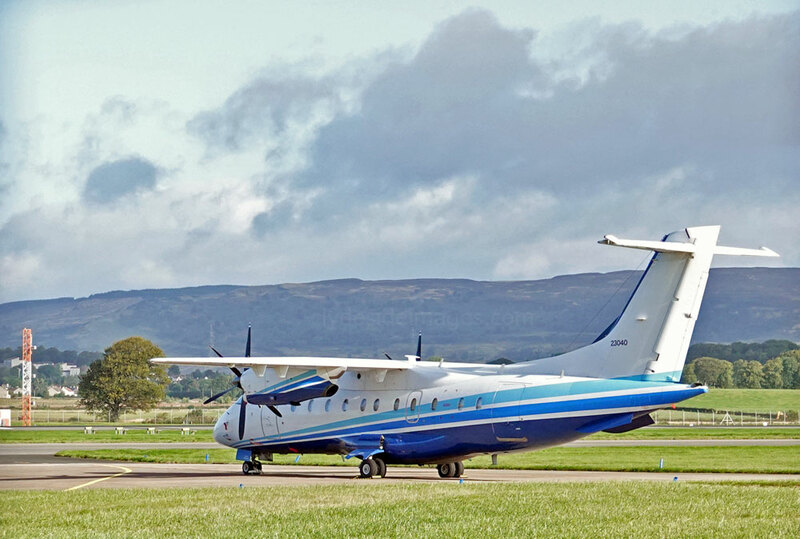 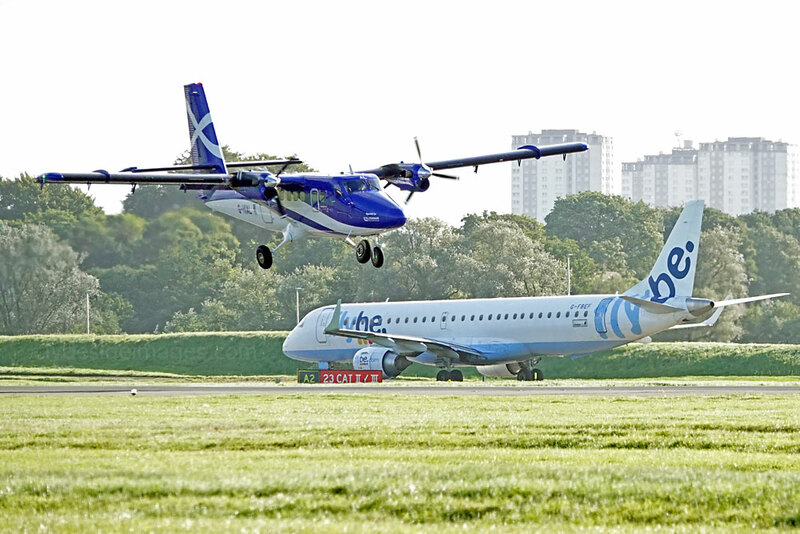 As far as I`m aware, no noteworthy prop liners visited Glasgow International this month, just the usual crop from the Flybe, Loganair and Aer Lingus Regional fleets. 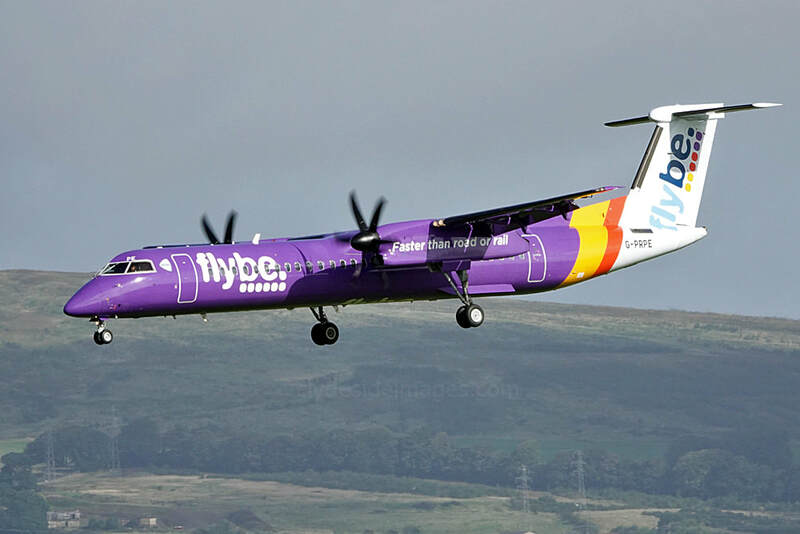 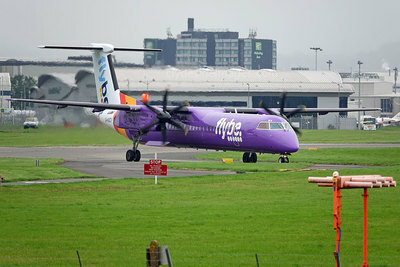 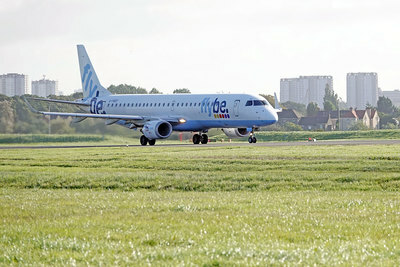 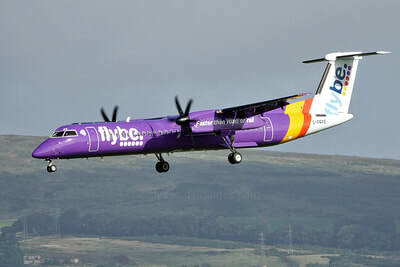 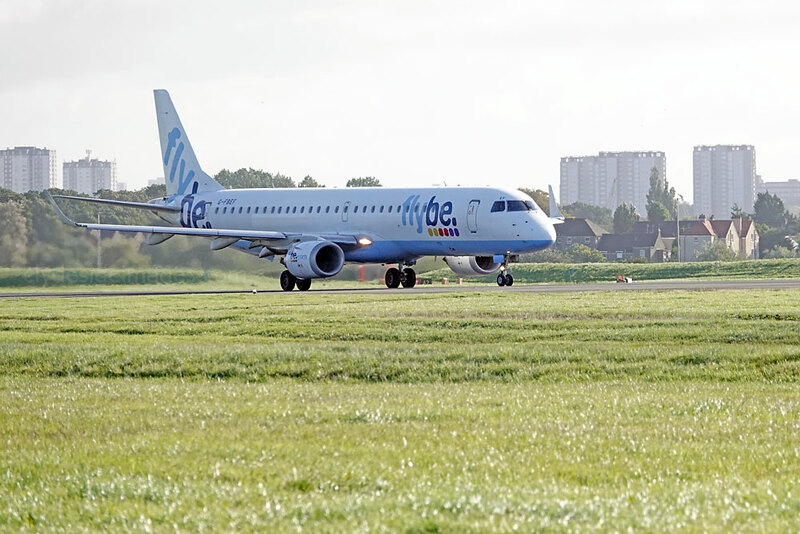 Meanwhile, on 4 September, Flybe unveiled the first of its aircraft to be repainted in a revamped colour scheme. 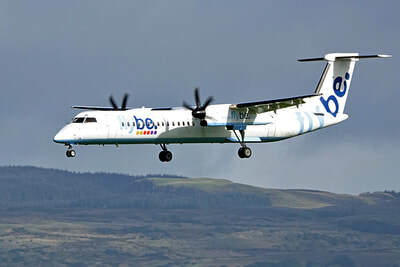 Bombardier Q400 G-JECP now sports the lighter, modern new look which will be applied to all other aircraft during their scheduled repainting and maintenance periods. 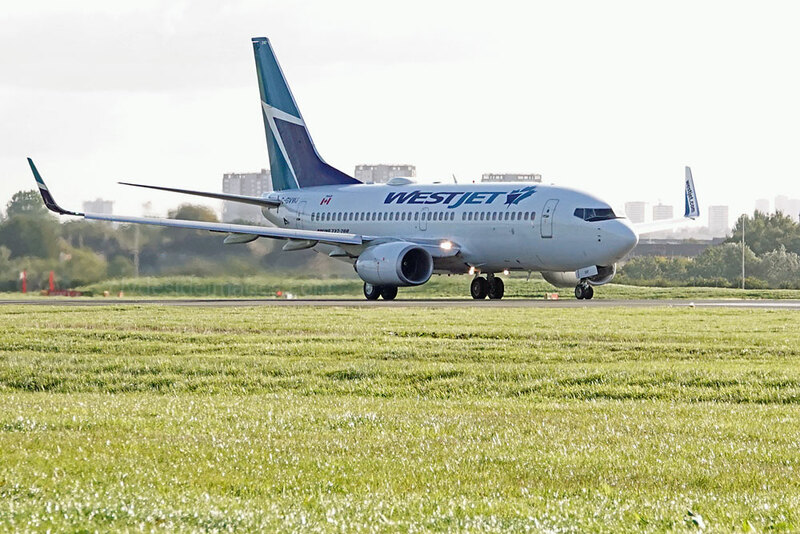 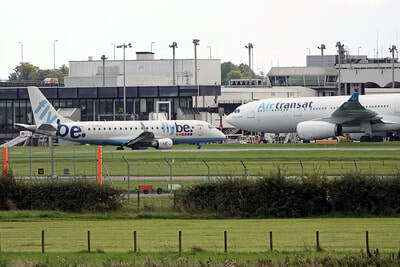 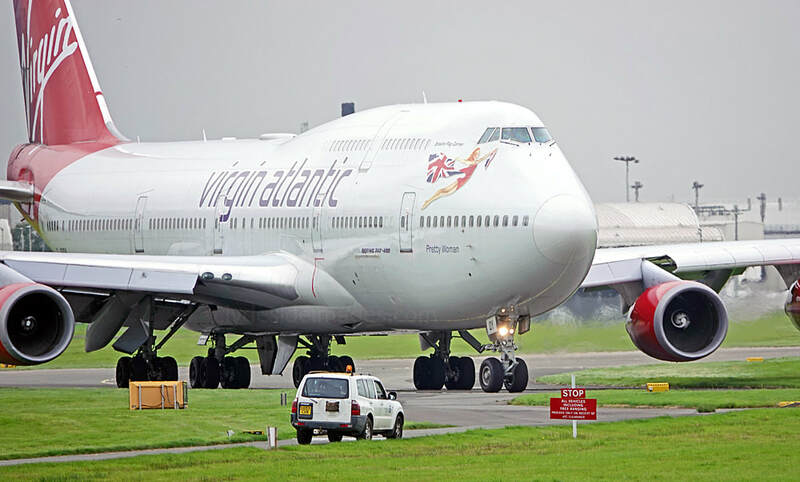 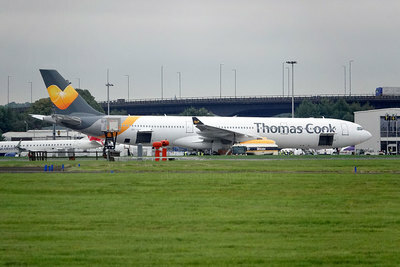 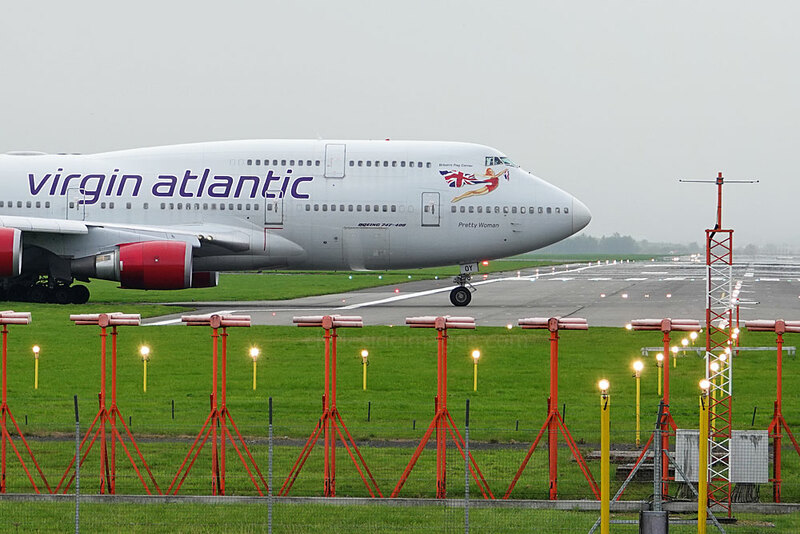 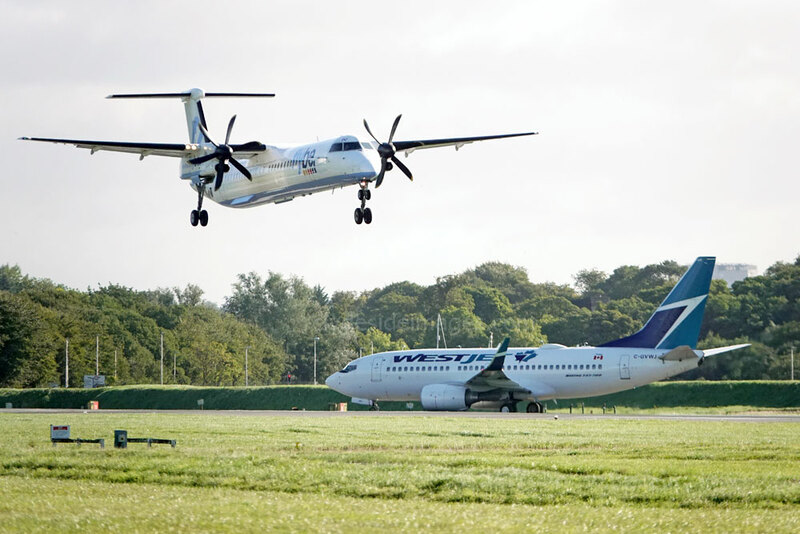 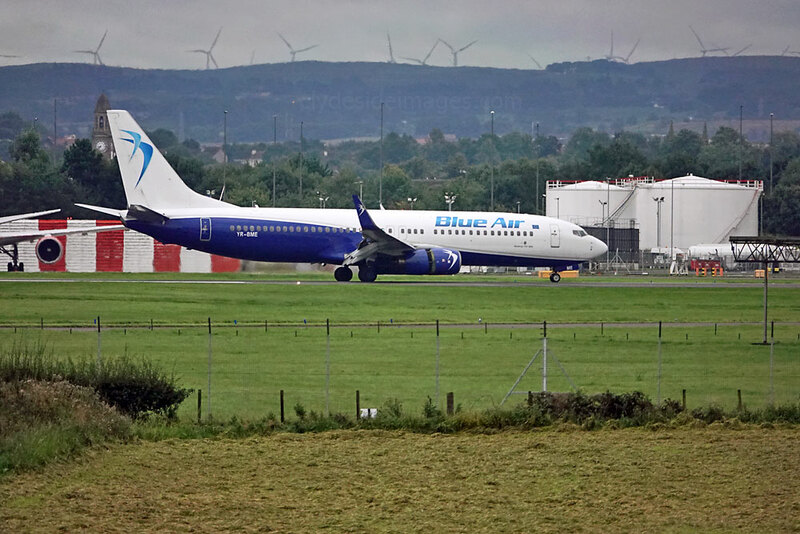 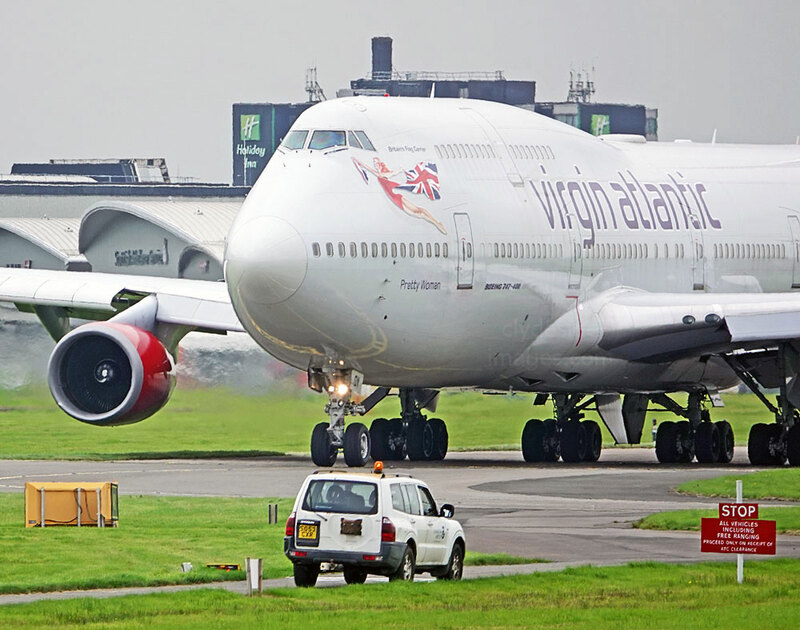 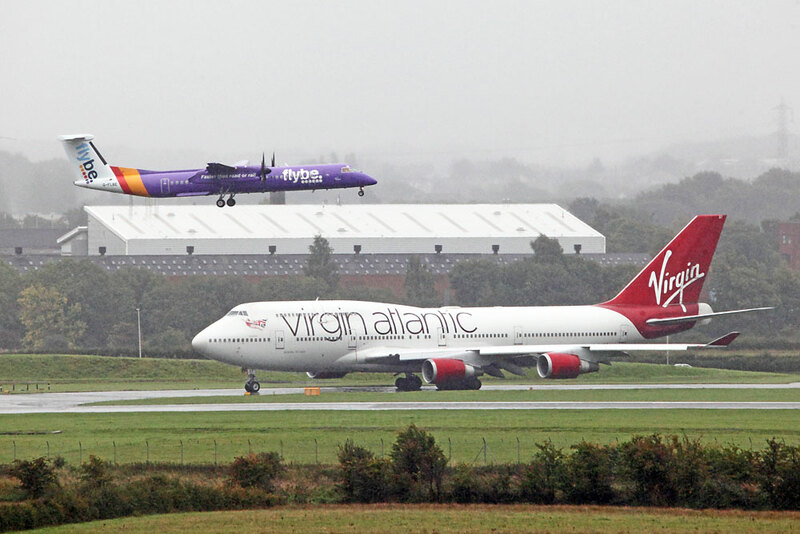 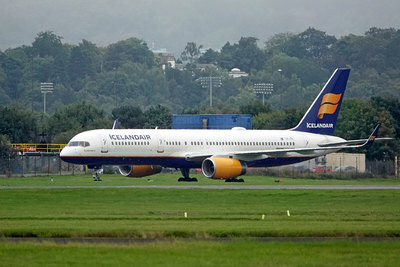 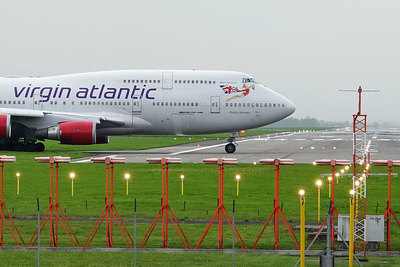 The remaining planes in the airline`s white and blue livery will be repainted first, followed by those which have worn the purple colours for longest. 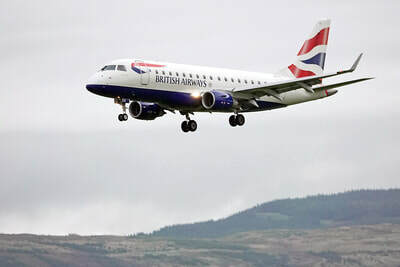 Four brand new Embraer 175 Regional Jets scheduled for delivery in July 2019 will arrive fresh from the factory already painted in the new scheme. 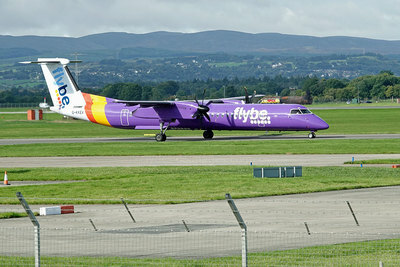 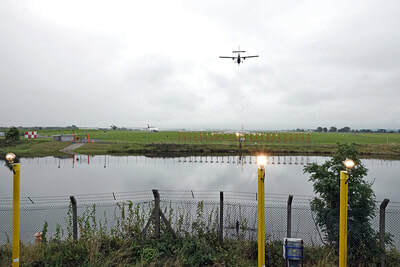 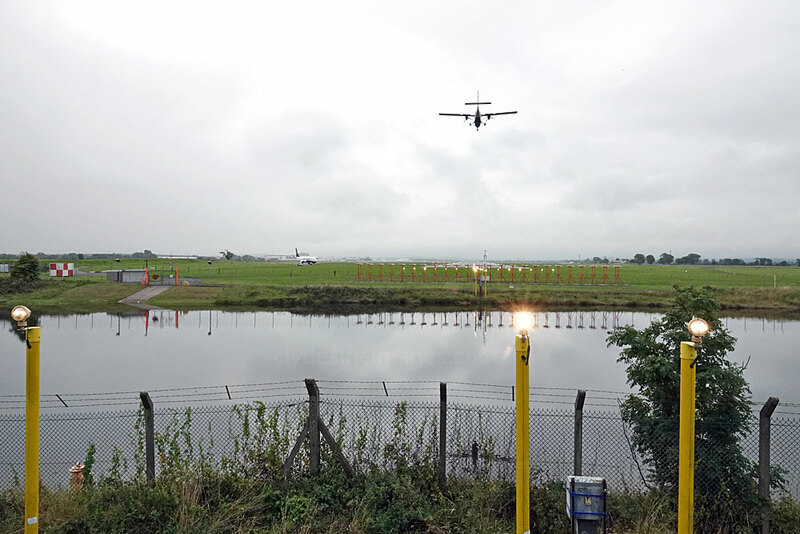 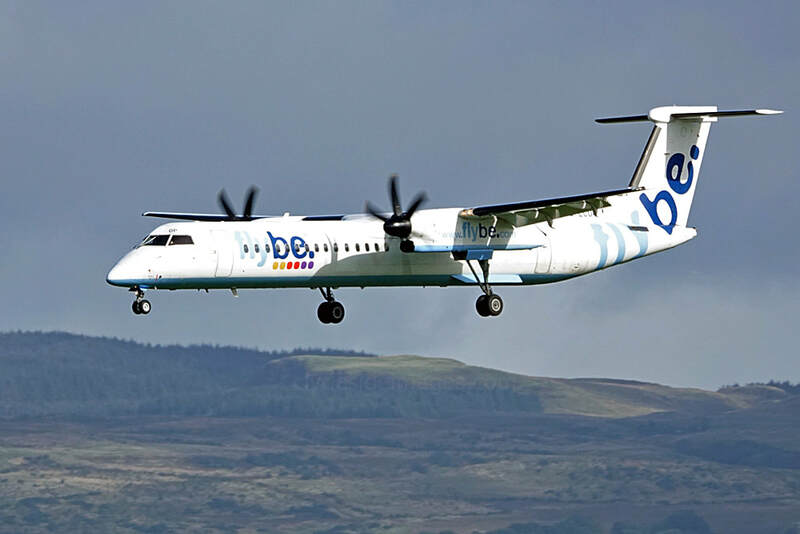 Flybe Dash 8 G-ECOK comes in to land on 15 September. 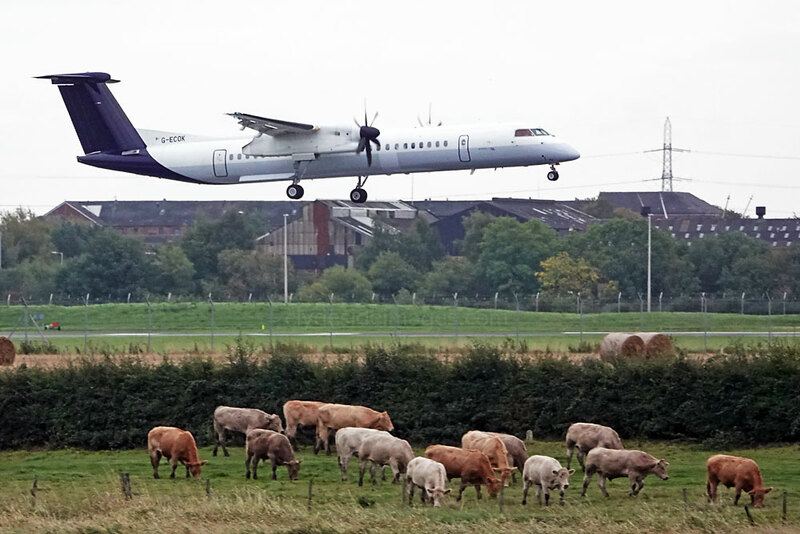 The local cows have seen it all before. 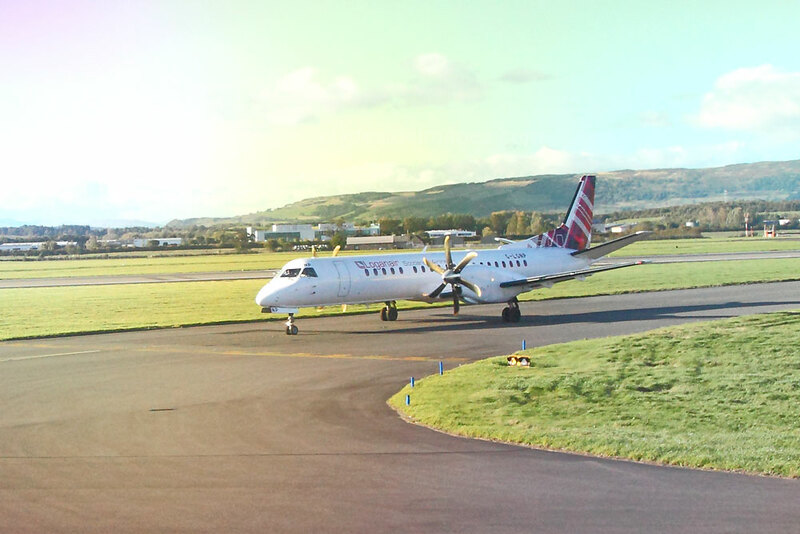 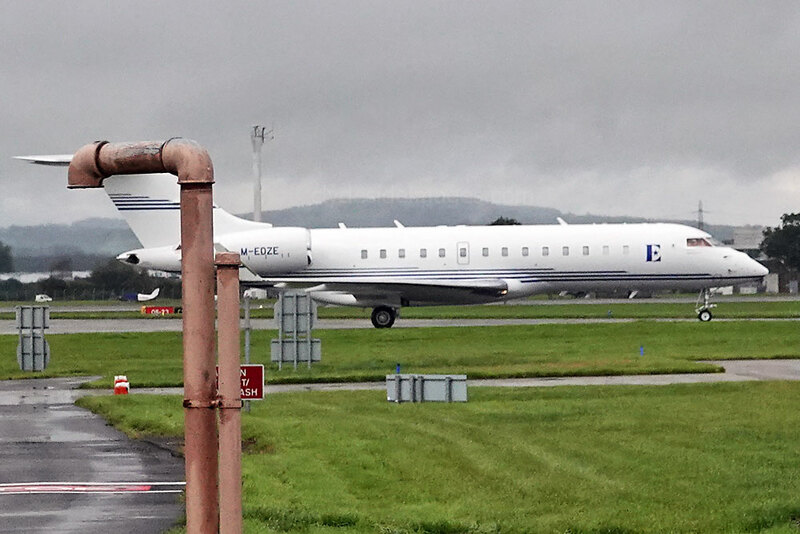 Manx-registered Global 6000 M-AATD on taxiway Y, Saturday 8 September 2018. 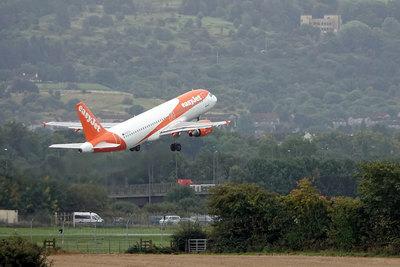 It was making a trip from /to Luton. 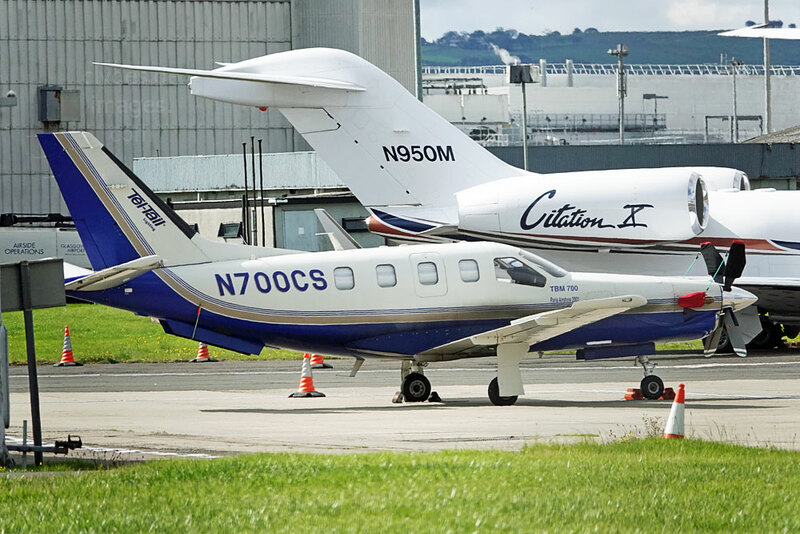 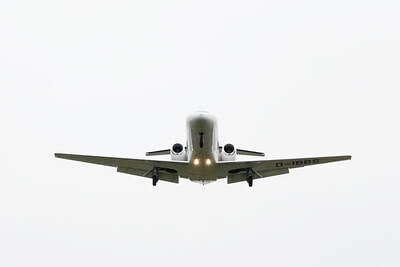 Textron Aviation`s Citationjet CJ4 N492CA was one of several biz-jets arriving on the 17th. It was routing Doncaster - Edinburgh. 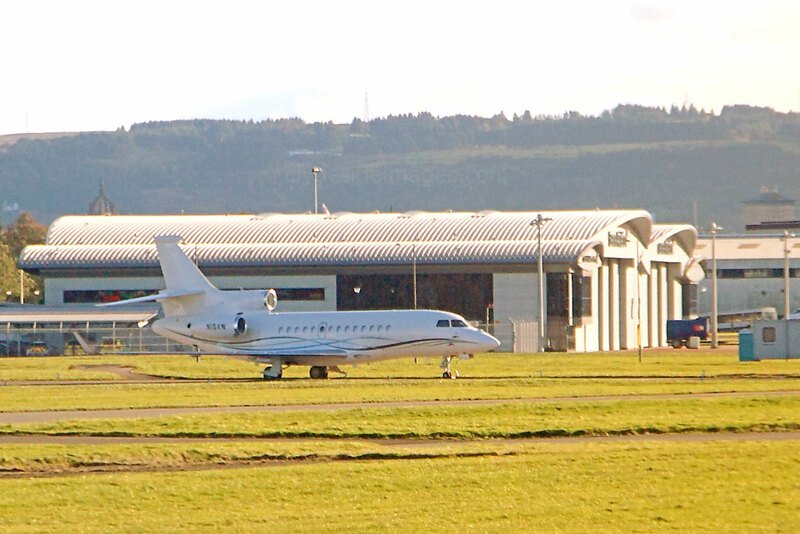 Global 6000 T7-WMB, seen here parked on Area R on the 17th, is registered in San Marino. Its next port of call was Malé, capital of the Maldives. 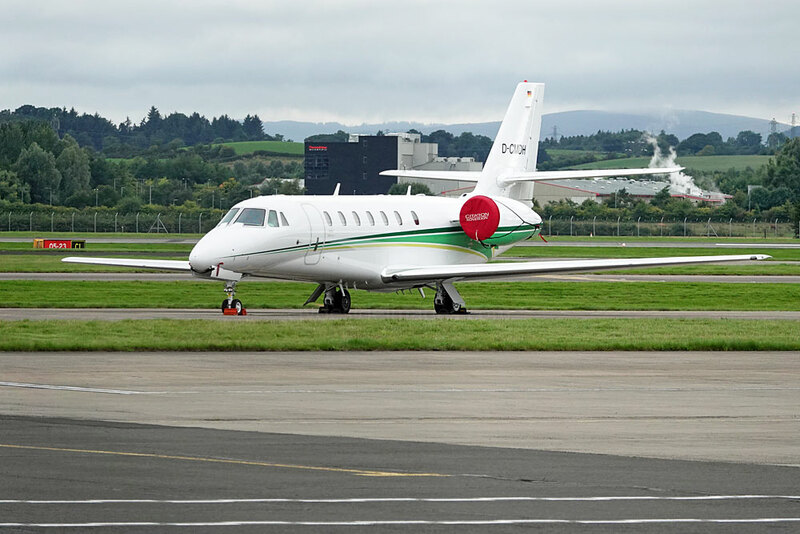 September`s visiting biz-jets continued with Boeing 757-256 EC-HDS Privilege Style returned, plus Cessna Citation Excel D-CAWM (21st): ​Dassault Falcon 7X N194W (f/v) and Embraer Legacy 450 D-BFIL (22nd); ​Challenger 300 N300LV (f/v) and Falcon 2000LX YU-FSS (23rd); ​Boeing 737-7AK(BBJ) D-AWBC PrivatAir, ​Cessna 750 Citation X T7-OCC (f/v), CitationJet CJ2 N538CF, Citation Excel CS-DSX and Learjet 40 I-FORR (24th); Gulfstream V-SP N83CW, Gulfstream IV N999AA, Falcon 900B N10AZ (f/v), Cessna Citation III OY-EDP, Citation Excel CS-DQB NetJets (25th); Falcon 2000 N84SV (f/v), Falcon 900 N108FJ (f/v), Gulfstream G150 D-CGEP plus Citation XLSs CS-DXY and G-JALS (26th); Embraer Phenom 300 D-CLAM (f/v) and Citation Mustang G-KLNW (27th); ​Gulfstream V-SP CS-DKK, Gulfstream IV-SP N999AA (f/v), plus Hawker Beechcraft 800XPs N534RV and CS-DRW (28th); ​Global 6000 CS-GLA NetJets, plus Cessna CitationJet CJ2 LX-JCT (f/v)(29th). 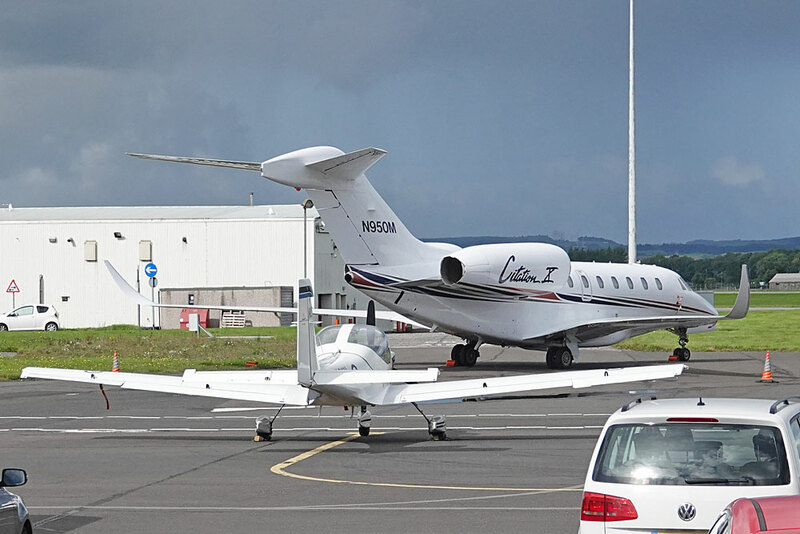 Polish CitationJet CJ1 SP-AST and Falcon 2000LX G-SMSM of Luxaviation UK, Area J, Thursday 20 September 2018. 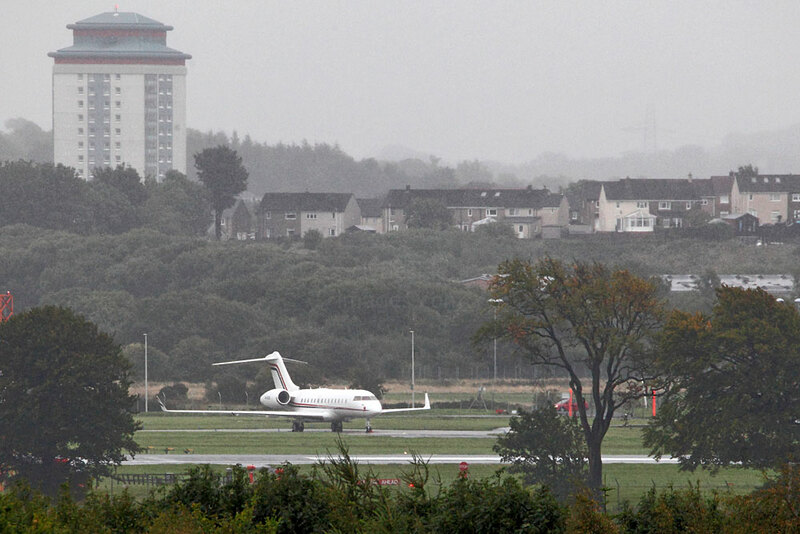 Dassault Falcon 7X N194W parked on Area R shortly after arriving on Saturday 22 September due to the restrictions at Edinburgh.. 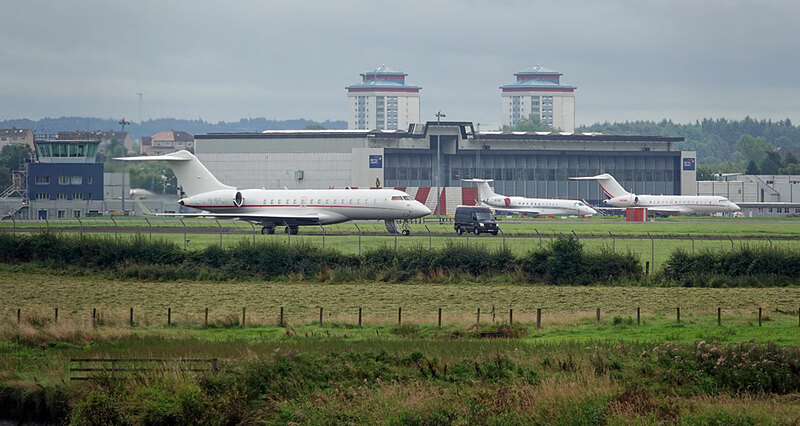 Global 6000s VQ-BCC and N805WM, plus Legacy 650 OE-IBM, parked up on the morning of Sunday 2 September 2018. 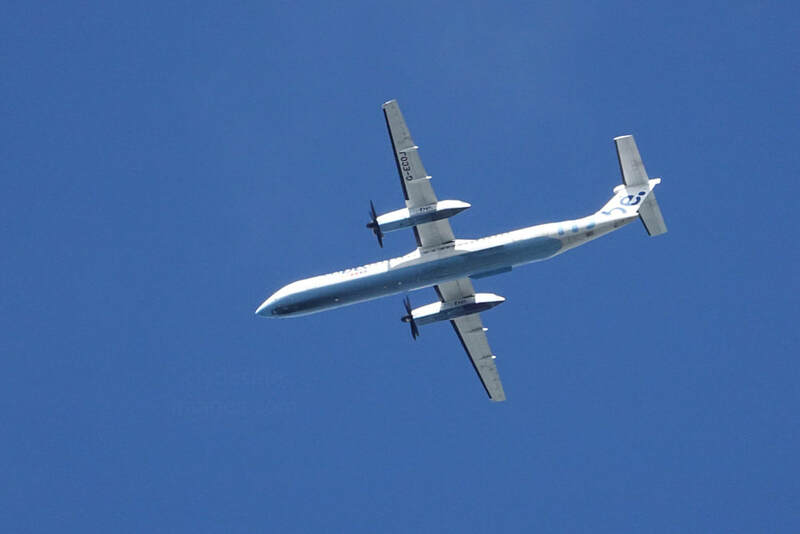 Bearing the Netherlands registration PH-TCN (f/v), this Piaggio P-180 Avanti flew in from Rotterdam on Tuesday 18 September. ​Pilatus PC-12 2-DARE, Piaggio P-180 Avanti PH-TCN and King Air 200 G-JASS (18th); ​Pilatus PC-12 M-SAIL (19th): King Air C90 G-MOSJ (21st); King Air 350 G-SRBM and Piper PA-18 G-BWOR (23rd); ​SOCATA TBM-700 N762RS (f/v) and King Air 200 G-FSEU (24th); AW189 G-MCGM HM Coastguard (26th); ​AgustaWestland AW109S Grand New G-HLCM (f/v) (27th); Pilatus PC-12 M-YBLS and Piaggio P-180 Avanti D-IRBS (28th); Pilatus PC-12 LX-JFW arrived and King Air 350 M-LLMW departed (29th). 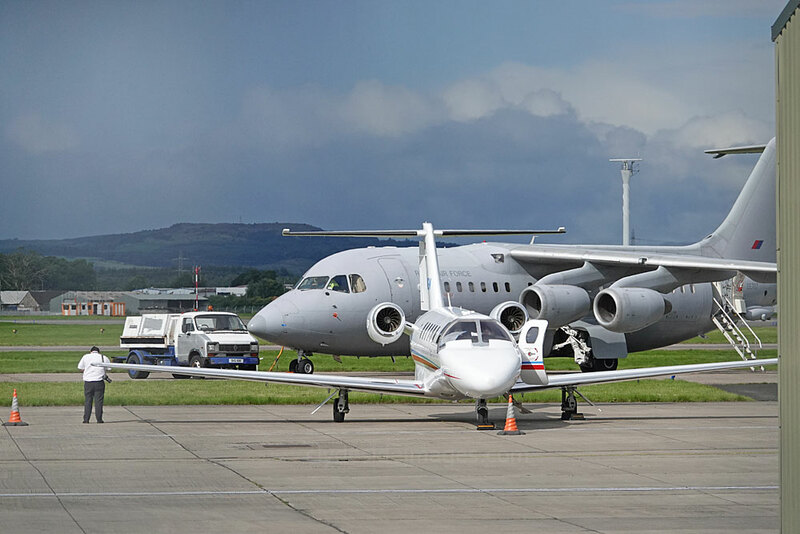 RAF Beechcraft Shadow R.1 (350CER) ZZ418 (f/v) call-sign `Snake 48` and BAe146-100 CC.2 ZE701 both called in on Monday 3 September. 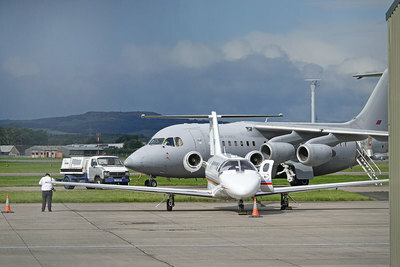 ​Dornier C-146A Wolfhound 12-3040 United States Air Force (f/v) (above) arrived on the 10th. Airbus A319-133(CJ) 15+01 and Bombardier BD-700-1A11 Global 5000 14+04, both of the German Air Force, did a `go-around` above Runway 23 in the morning of the 13th. T-6A Texan II N2858B (f/v) RAF called in later that day. 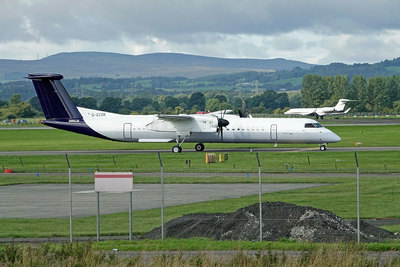 Lockheed KC-130J 168071 USMC call-sign ‘Bronco 21’ arrived on Tuesday 25 September and parked up on the northside of the airfield. 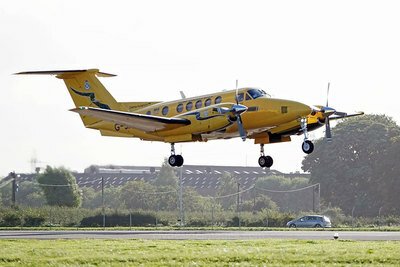 Beech RC-12N Huron 88-0325 of the US Army, call-sign ‘Argus 89’ arrived on the 28th and KC-130J 168071 USMC departed. USAF C-146A Wolfhound 10-3068 (f/v) call-sign `Rich 1046`arrived at 19:05 hrs on the 30th and parked on Area R where it remained until well into October. 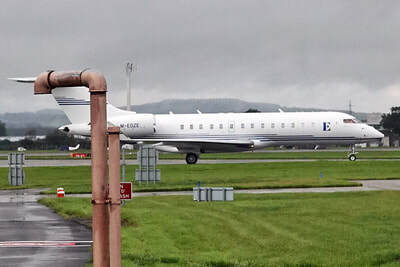 ​BAe146-200QC C.3 ZE707 callsign `Kittyhawk 43` arrived on the 6th with Chancellor of the Exchequer Philip Hammond and his entourage. 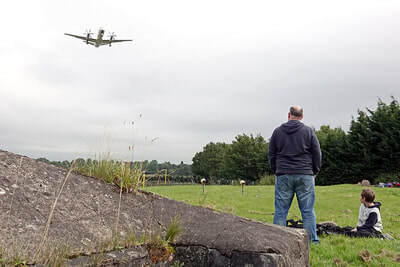 The RAF aircraft may have suffered a cracked windscreen possibly as a result of a bird strike and ZE708 `Ascot 1906` flew in later to take the contingent back down South. While the VIPs were disembarking locally-based UAS Grob G.115E Tutor G-CGKR declared an emergency due to a drop in oil pressure. 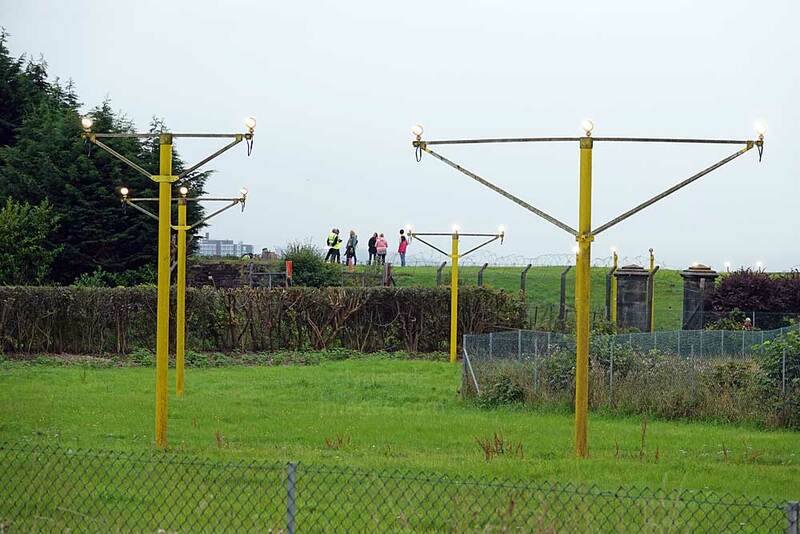 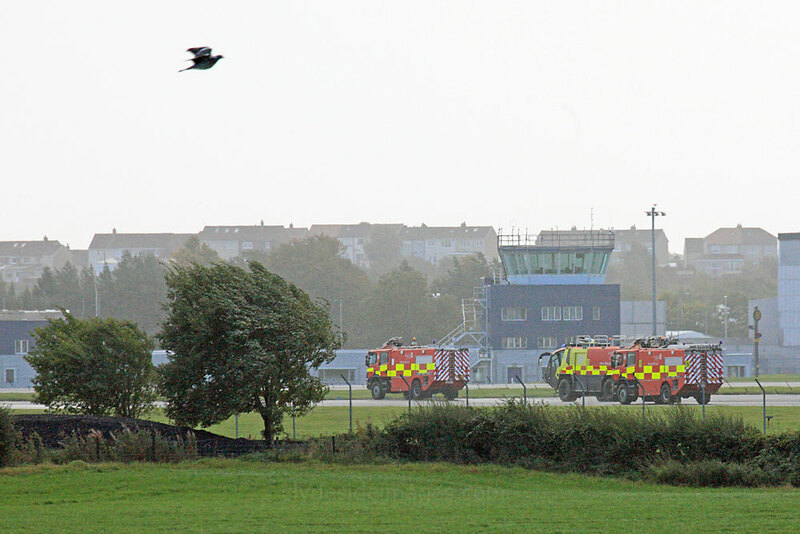 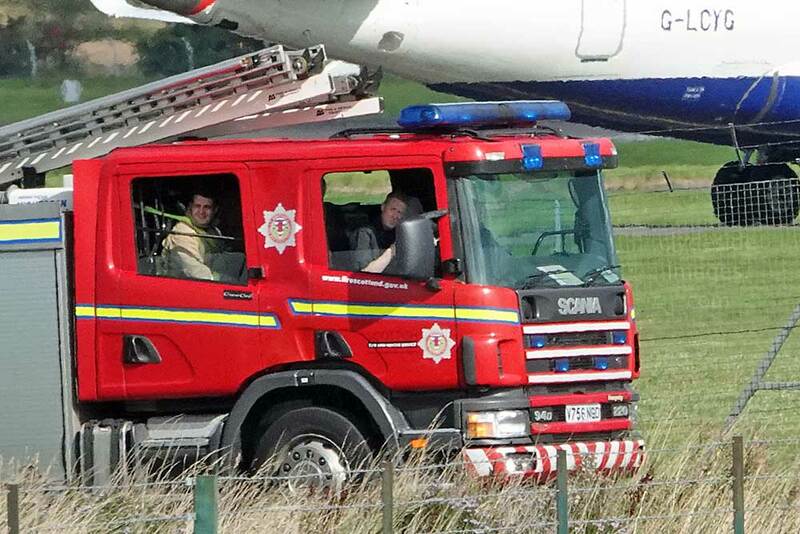 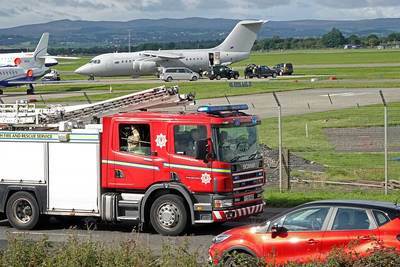 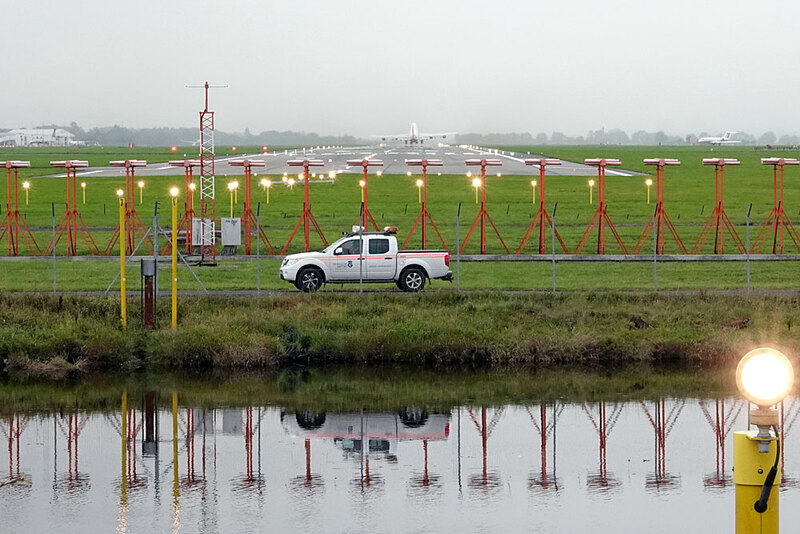 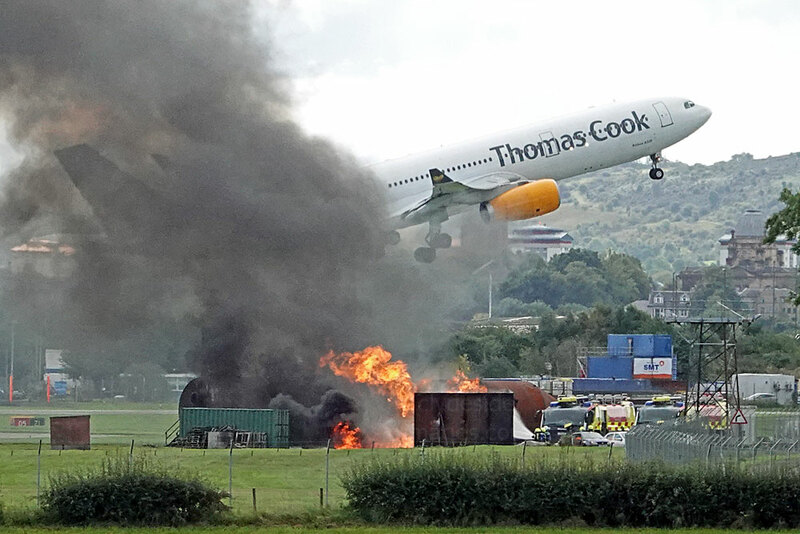 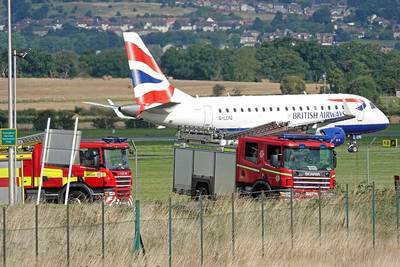 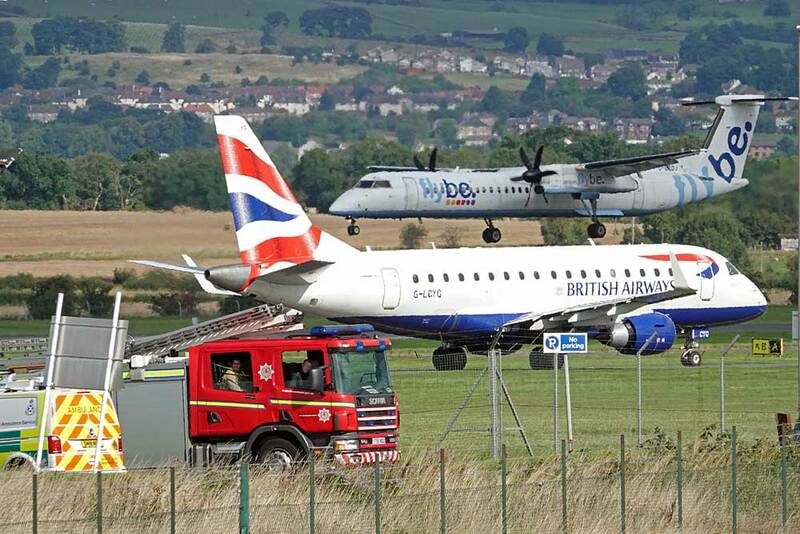 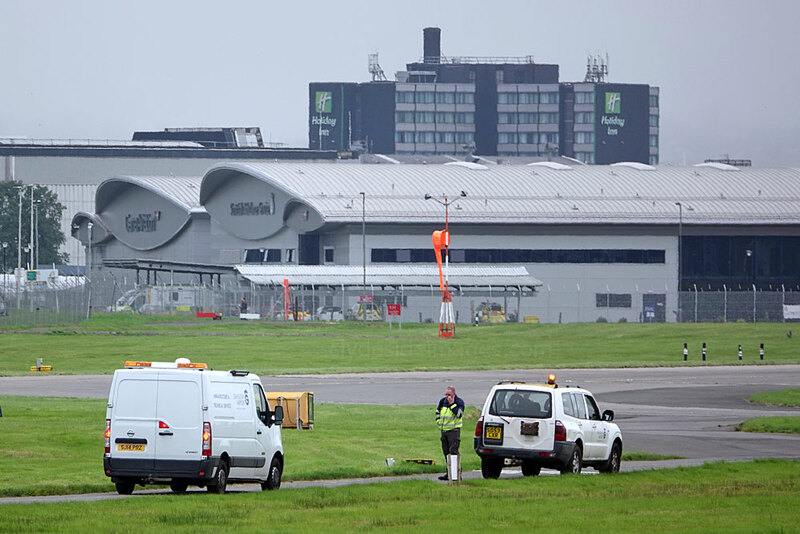 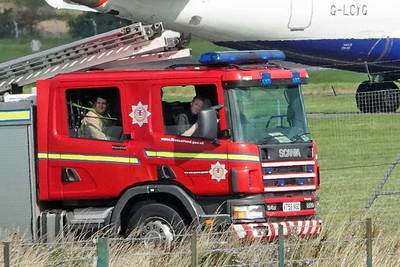 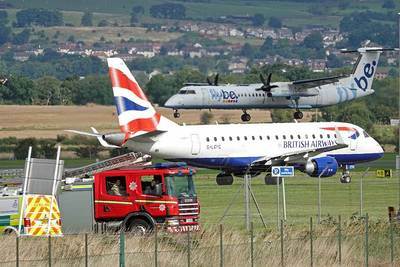 There was a full response with the Airport Fire & Rescue, Scottish Fire & Rescue, Police and Ambulance all in attendance and somewhat unusually the Airport appliances took up position on the north side of the airfield, rather than at the RVP in Abbotsinch Road. 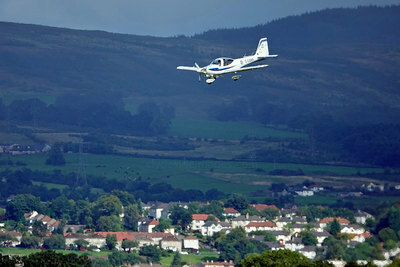 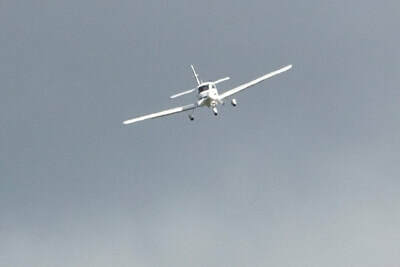 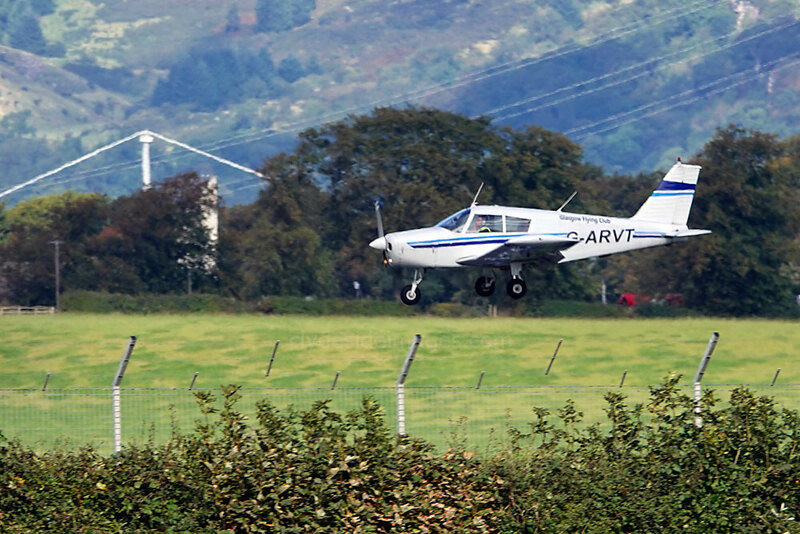 Fortunately the aircraft landed safely and the incident was quickly stood down.